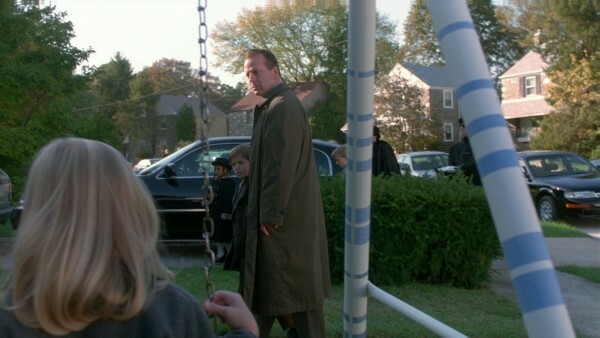 This article is part of an analysis project about M. Night Shyamalan‘s five films from 1999 to 2006: The Sixth Sense (1999), Unbreakable (2000), Signs (2002), The Village (2004) and Lady in the Water (2006). 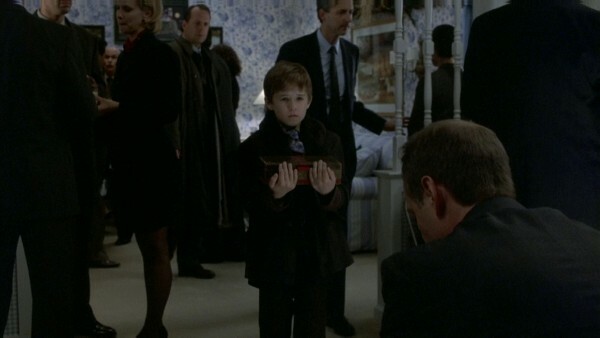 This is the third article about The Sixth Sense. The first is here, the second here. The articles about the other films can be found in this overview. 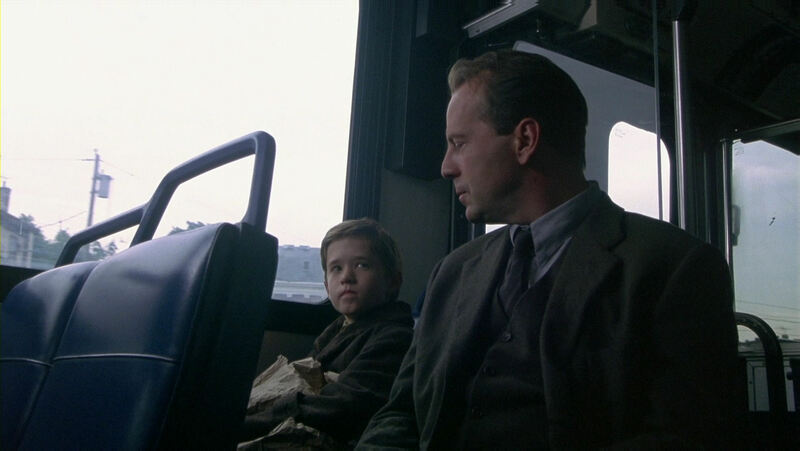 The purpose of this third article about The Sixth Sense is to explore some of the film’s structural aspects, especially a methodical examination of its motifs, which we have touched upon only in passing during the first articles. 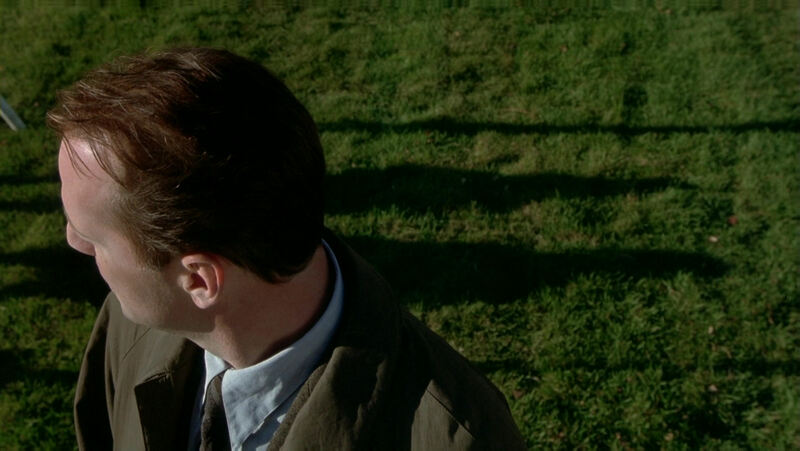 Before starting on the motifs, however, we will explore some more general aspects, namely Shyamalan’s use of backgrounds to unconscious effect, and the carefulness of his film’s construction. As for motifs, we will look at ancientness vs. modernity, the connection between statues and ghosts, female/male, timelessness, pretending and self-reflexivity, rituals, secrets, thrice-occurring elements and some of the more subtle aspects of motifs we already have familiarised ourselves with in the earlier articles, for example the colour red. The article will end with an analysis of the post-funeral sequence, which constitutes a short film unto itself within the larger structure of The Sixth Sense. 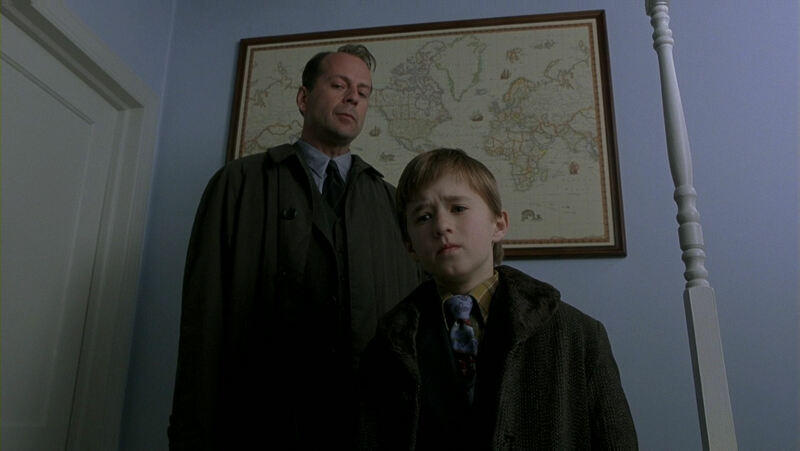 For readers unfamiliar with the story of The Sixth Sense, here is a basic outline of the premise. In order to discuss the film properly, I will have to reveal the whole plot, including the major plot twist at the end. Also, please be aware of the option to click on the frame grabs to enlarge them. Clicking on them yet again will enlarge them even further. 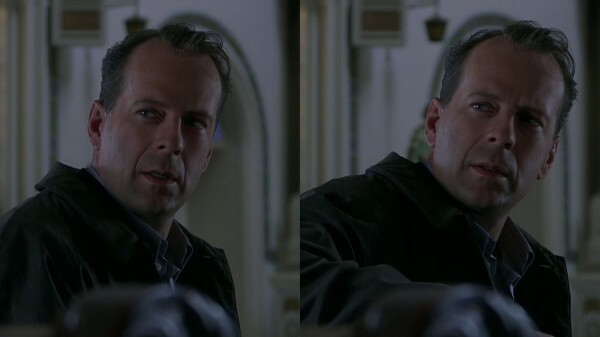 In all of the shots, except briefly when Malcolm turns around to start talking to Cole in the leftmost shot, a light on the wall is always visible over his head. 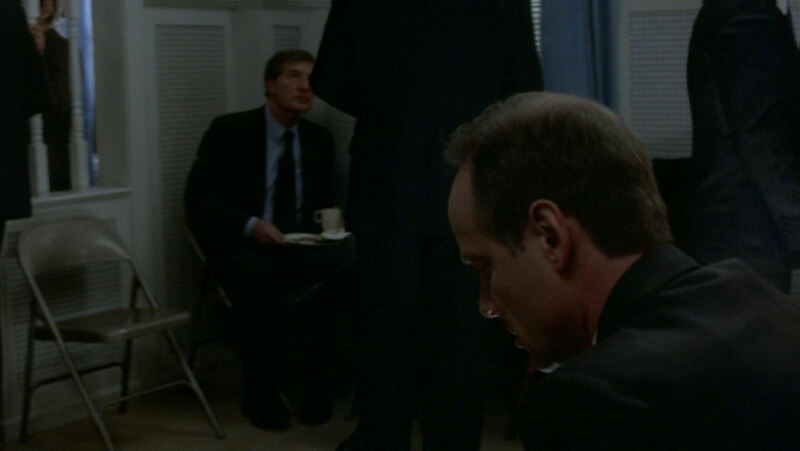 Then Cole leaves, ending the meeting on a disappointing note for Malcolm, who has failed to break through Cole’s emotional defence. In the next shot of Malcolm, the light has suddenly gone out. (The black object right over his head used to contain the light.) It is as if the extinguished light symbolises his disappointment and his dashed hopes and efforts. …then the camera pans down, to catch Malcolm coming home. 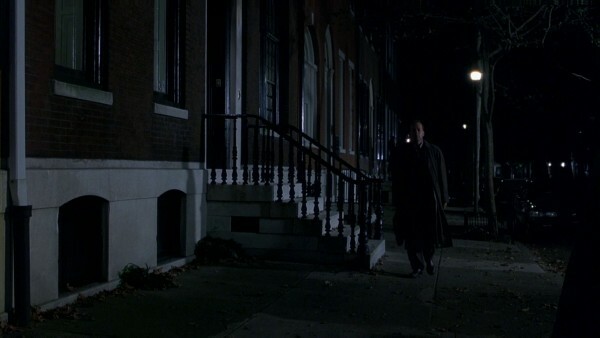 The camera movement seems intended to “reconnect” Malcolm with the light from the previous shot, in the form of the single street lamp near him. 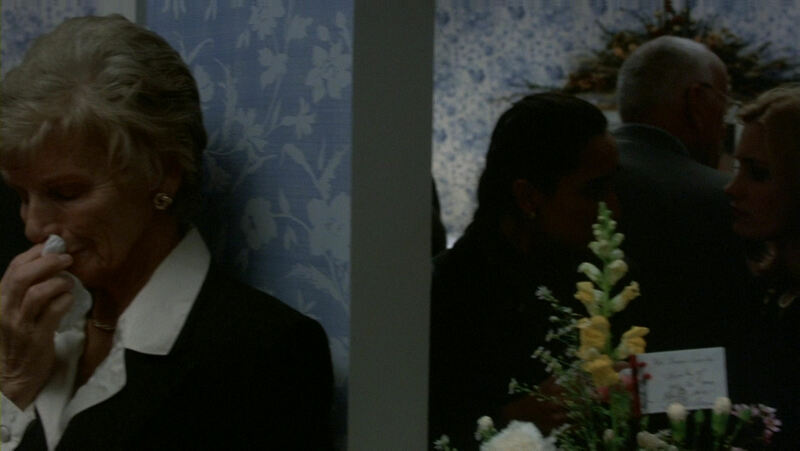 So the arch was employed for an elegant transition between scenes, but the means are so subtle that they will hardly register consciously with the viewer. 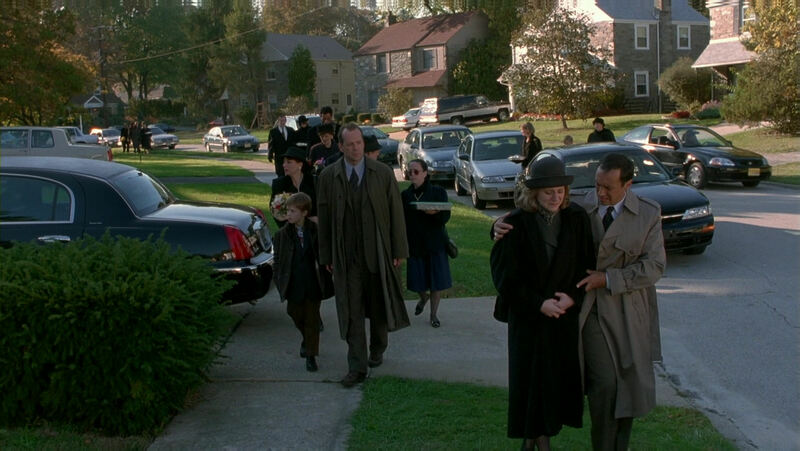 Connecting these scenes is thematically meaningful, too, since Malcolm will make as little progress with his wife Anna as with Cole. (A similar parallel, also in two scenes following each other, will occur later, when both the mind-reading scene and the restaurant scene end with Cole and Anna, respectively, leaving Malcolm.) The transition also uses doors, lights and arches, which are all important motifs of the film, so we can say that Shyamalan is writing a small sentence here, its syntax and words in a language specifically created for this film. 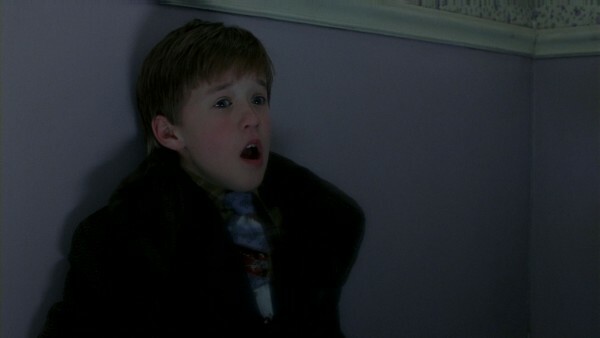 Above: Cole’s last glimpse of the first, utterly terrifying ghost. 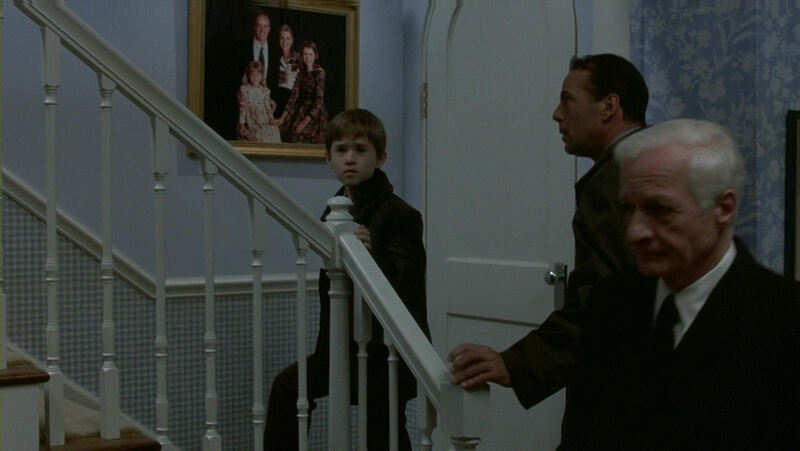 Below: the kitchen doorway serves as a representation of his memory of that fear, when he, much later, gingerly approaches the ghost of Kyra. The telephone wire is twisted, just like the fact that he will witness a twisted version of his mother. From the perhaps most visually arresting scene of the film – almost entirely built around circles and spirals. Here the figure on Cole’s shirt collar seems to reflect what he looks at, a red balloon within a constellation of several circles. There are several circles-within-circles on the collar, the thick red one reminiscent of the balloon. …it is difficult to determine, but they could be almost exactly alike. 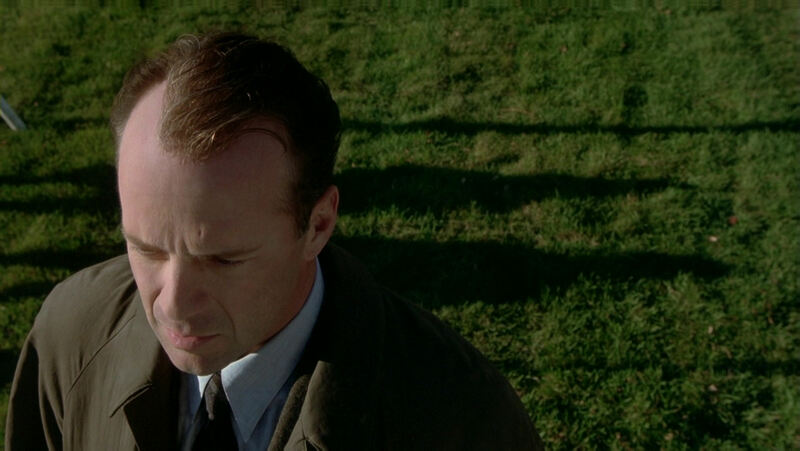 Constantly shining through when we have dealt with a number of aspects of The Sixth Sense, is M. Night Shyamalan‘s careful attention to details. Just have a look at the first shot of the scene where Malcolm sits in the basement pondering Cole’s case. 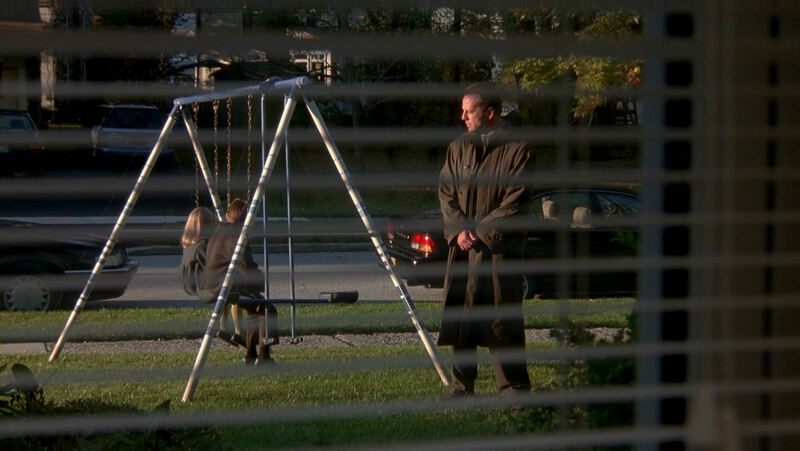 As he is rocking his chair slightly back and forth, the focus of the background is altering very slightly for each movement, as if Shyamalan wanted, in the most subtle manner imaginable, to reinforce our experience of Malcolm’s rocking movement. 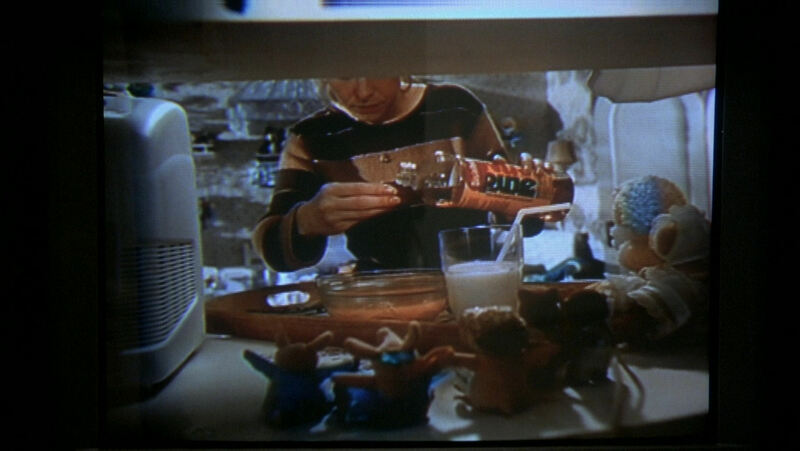 This is an entirely throw-away item, because the effect is almost invisible, but nevertheless it is put into the film. 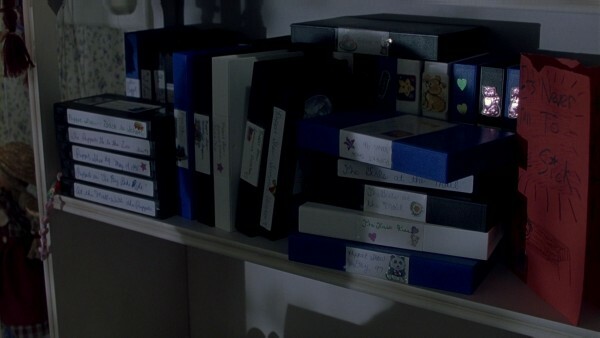 Preparation: When Cole enters Kyra’s bedroom in the post-funeral sequence, Shyamalan is carefully showing us stacks of video cassettes, in preparation, and justification, for the video evidence that Kyra has managed to capture about her poisoning. 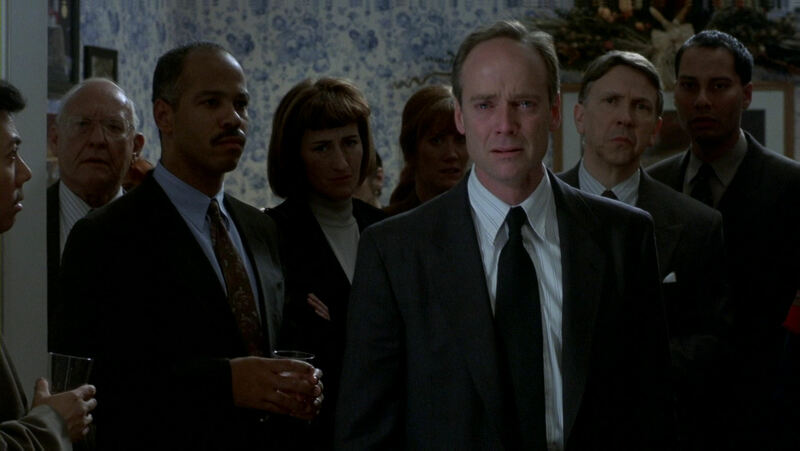 Wrapping up loose ends: The reason Cole knows the secret of “Stuttering Stanley”, is finally revealed to us in the late scene with the burned ghost in the dressing room. We realise that she died in a fire a long time ago and was a teacher, which is why she knows about Stanley’s stuttering as a child. 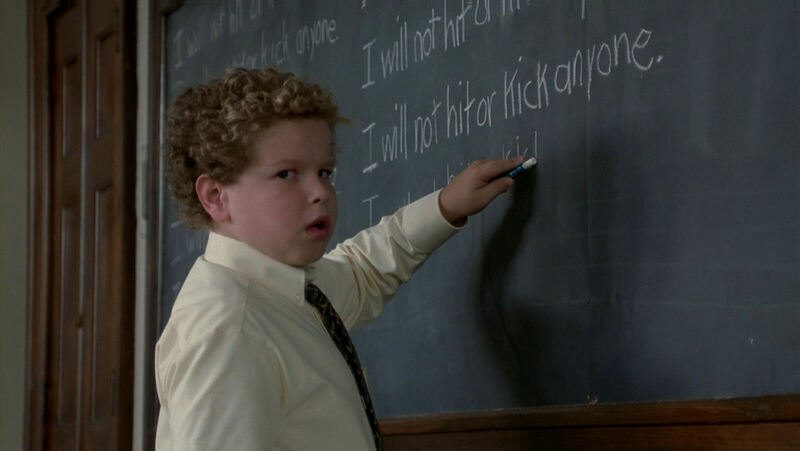 In a dialogue line in the “Stuttering Stanley” scene, it is carefully mentioned that Stanley himself was a pupil at the same school. Consistency and coherence: Cole tells Malcolm about the “harmless” drawings he started doing to put the worried adults to ease, for example about rainbows (“They don’t have meetings about rainbows”). Later when Lynn is tidying, we see such drawings in his room. In reflection of Cole’s yearning for his father and a nuclear family life, all four drawings include adult males, and three of them depict couples with children. Gradual revelations: Having escaped the kitchen ghost, a terrified Cole sits in his tent while Shyamalan strikingly reveals the extent and number of the talismans Cole has stolen from churches, as protection against ghosts. We realise that the tent has become a church at home, his own private “sanctuary”. 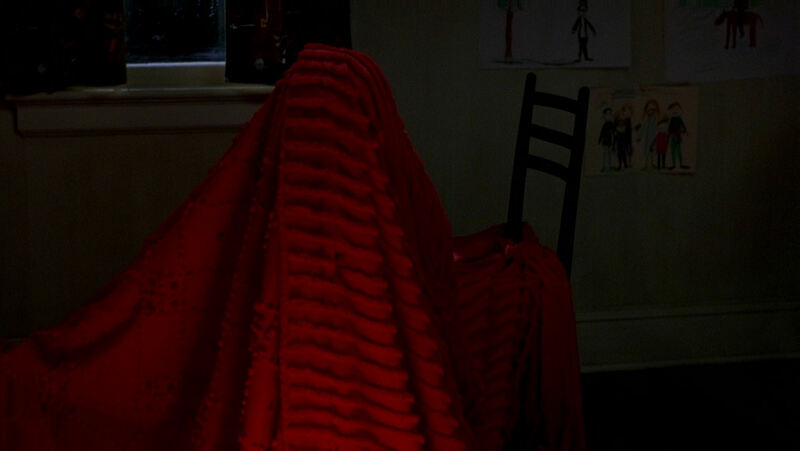 Shyamalan ends the scene with a shot from outside the tent, with the talismans in shadowy relief through the tent fabric. 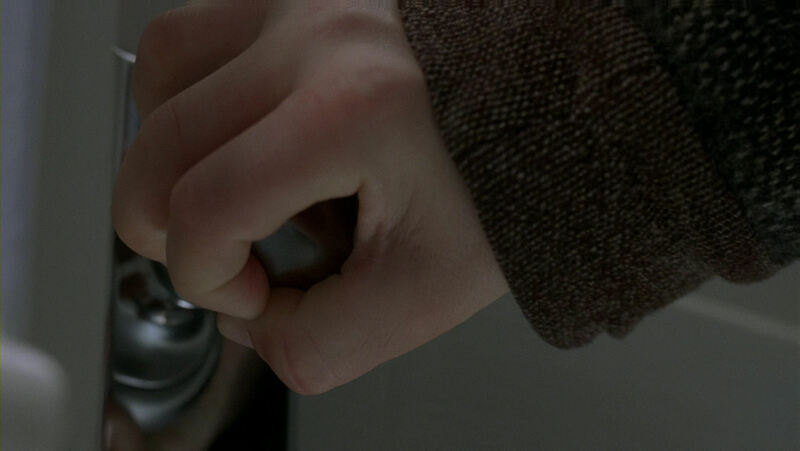 Understandably, Cole’s hand is shaking, with the effect that the illumination from his flashlight appears to cause the talismans to move. It is almost like a puppet theatre, which foreshadows Kyra’s own puppet theatre later in the film. But more importantly, the moving talismans create a striking transition to the next scene, which features a school stage play. Striking but logical mise-èn scene: Above we see one of the most sinister shots of the entire film, with the outline of Kyra’s ghost standing motionless inside the torn-down tent. The tent is lit up from the inside, but the eerie effect is entirely logical, because in his fear Cole fled the tent, losing his flashlight in the process. 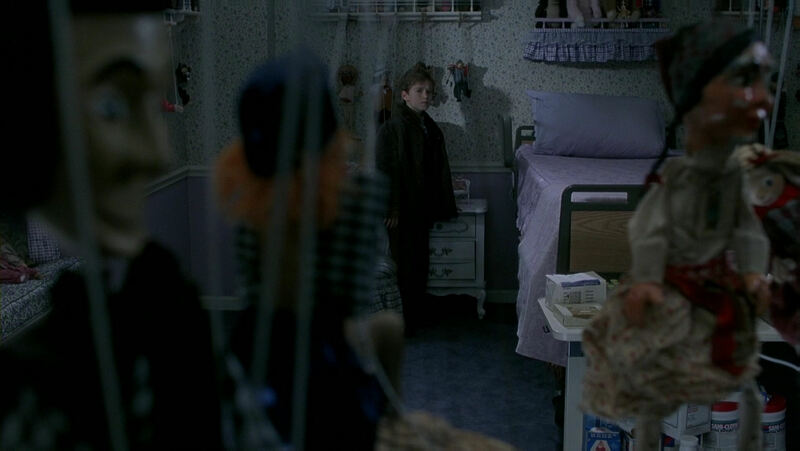 Just before, suspense is created when Cole feels that a ghost is nearby, but he needs to repair his tent. For when he stormed into his mother’s room in the previous scene, alarmed by her moaning, he tore down part of it. So the suspense is not contrived, but founded on a consistent, logical and understandable outcome of the previous situation. Impressive pedantry: After Cole has calmed his mother, we see him before the tent, with exactly three clothes pegs on the floor. Then he is carefully shown repairing the tent with these three pegs (in accordance with Shyamalan’s approach, as discussed in the first article, of creating suspense by slowing down the film). When Kyra’s ghost later enters the tent, exactly three pegs (not the same though) are unfastened. This also ties in, of course, with the motif of thrice-occurring elements, to which we will return. The toy soldiers: Significantly, the small action figures that Cole is so fond of span several eras (and two continents): there are Roman soldiers (one of them speaks Latin, Cole says), knights, American indians, American soldiers during the Civil War and modern-day soldiers. The latter are specifically, seemingly significantly, placed in the Vietnam War by Cole’s dialogue. 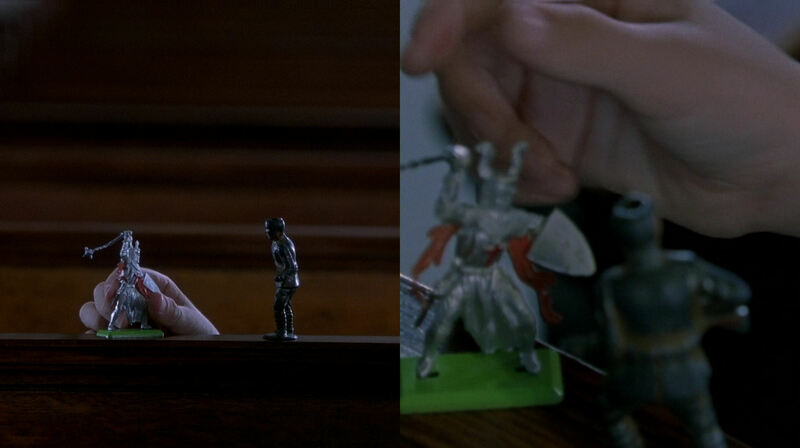 On the other end of the violence/peace axis, Cole has a vast collection of Christian figurines. Toy soldiers fight each other across the ages. 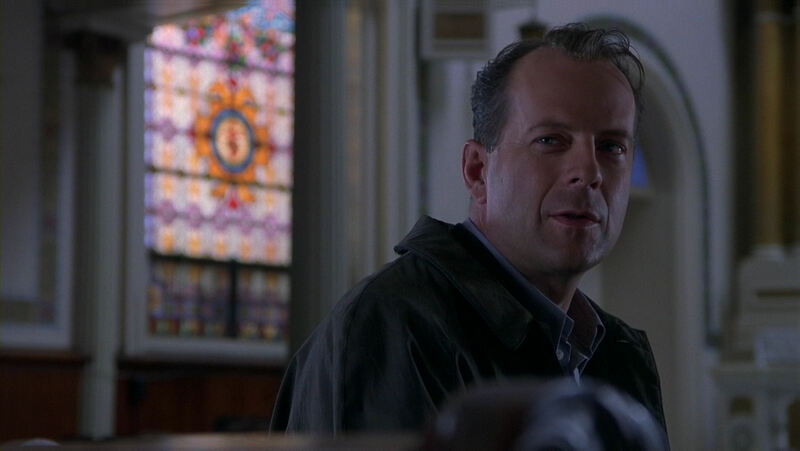 The church: During the first church scene, Malcolm specifically reaches back to the past: “You know, in the olden days in Europe, people used to hide out in churches. They would claim sanctuary.” The church building is itself ancient, and its being named after St. Augustine connects it further to early Christianity. Similar to the shot from the first ending, it is also interesting to see how Cole is shot in connection to glass paintings inside the church. 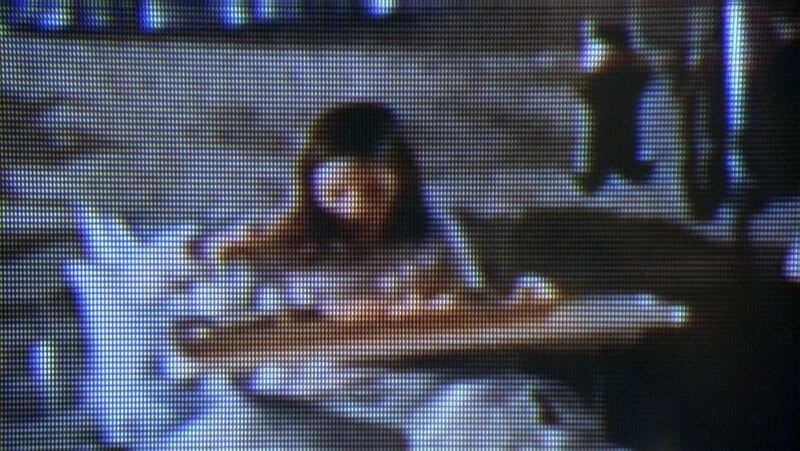 In one of the images, toy soldiers of the modern Vietnam War features in the same shot as the old paintings. An American Vietnam soldier (on the banister) with an ancient glass painting in the background. Soon toy indians fighting each other get the same treatment. 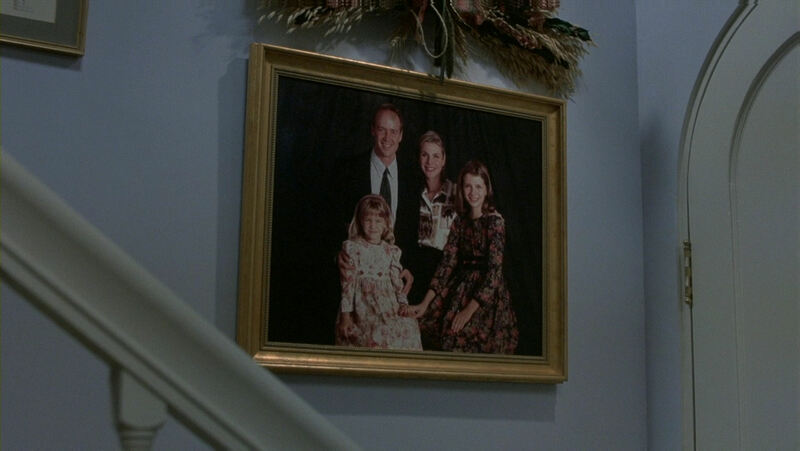 After Cole has left the scene, the camera stays on, to dwell on another painting. 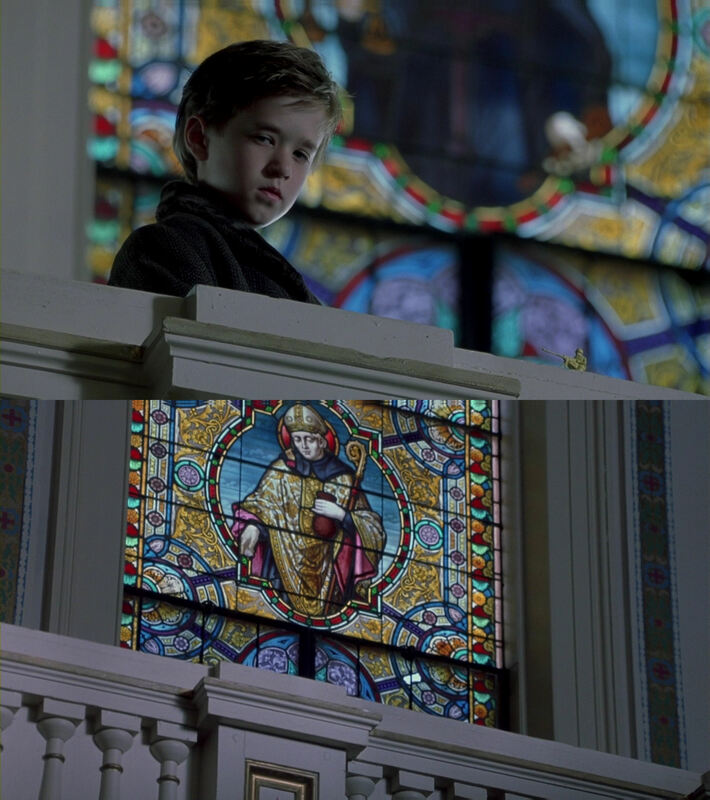 In the first church scene, too, Cole is often visually connected to glass paintings. The history of Philadelphia: The statues of Philadelphia, to which we will soon return, play a visually prominent role in the film. 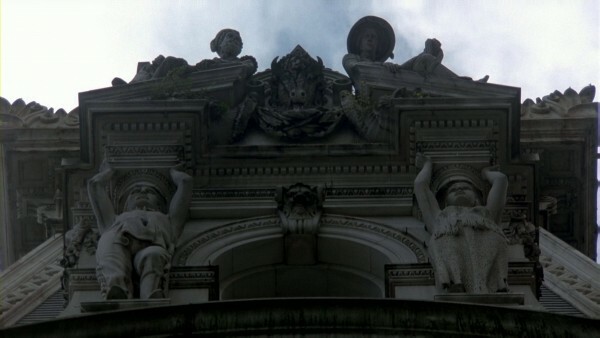 There is a cut from the first statue of the film, a detail of the Washington Monument, to a view of a modern cityscape – as if the cut, assisted by the sound of a helicopter over both images, is connecting two different historical eras. The lesson in the “Stuttering Stanley” scene is about the city’s history, and Cole has interesting, and subversive, things to say about that, from his experience with ghosts from past ages. 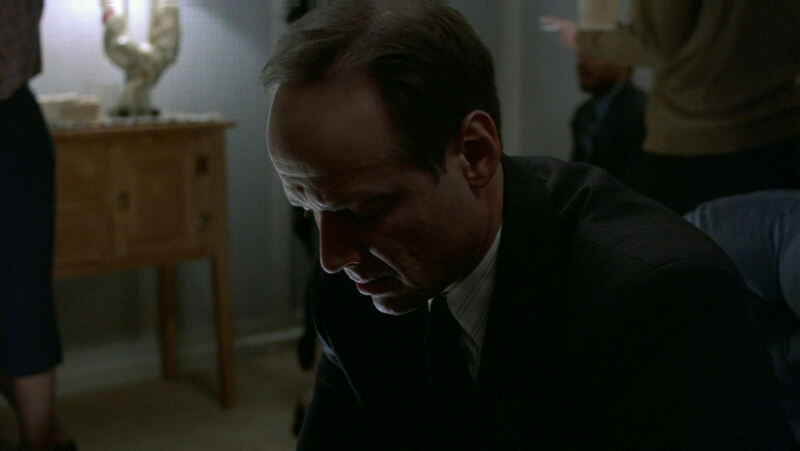 Additionally, when waiting for his first meeting with Cole, Malcolm sits near a memorial stone. 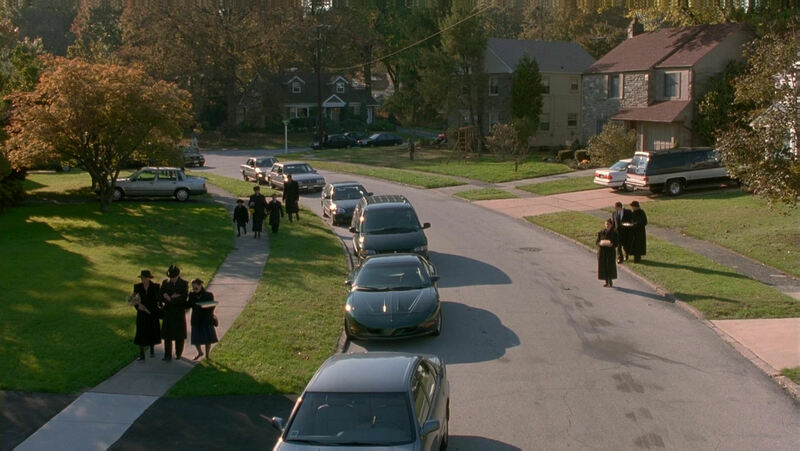 The Amish are also mentioned in the film, which fits very nicely since they are living by the tenets of an older age, in enclaves surrounded by the modern world. Their pacifist world view is also in contrast to the film’s theme of violence. 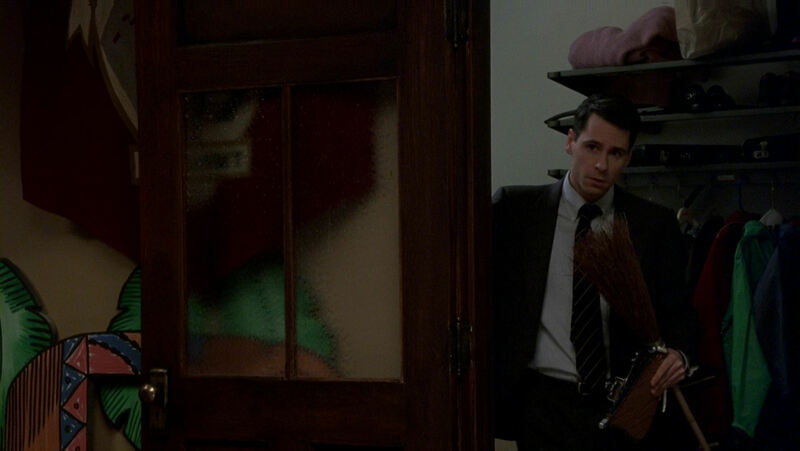 On a narrower level, the characters’ own past: Cole clings to a number of his father’s left-behind items. The photographs on the wall of Lynn and Cole’s past, as well as the photograph of Malcolm and his rowing club team, and the rowing club sweatshirt, worn from long use, he is still wearing. Lynn is preoccupied by the bumblebee pendant, which she has after her own mother. Related to this is the Burmese Sapphire ring from the antique shop scene, the way it communicates something across time, and the way it reminds Anna of the ring that the deceased Malcolm has left behind. Voices from the past: the voices of Malcolm, Vincent Grey, Anna, her family, as well as Kyra and her mother are preserved on audiotape and videotape. When he is about to start stuttering, and later will explode with rage, the American flag also plays some part in the shot. 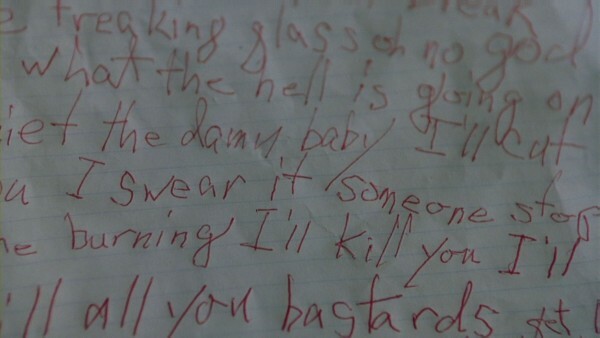 When Cole tries his hand at free association writing, horrible things keep spilling out of his mind. The violence permeating the film is even used to amusing effect. 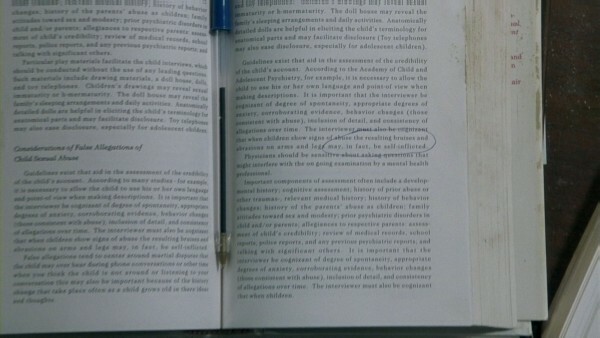 It turns out that the reason for the pupil’s punishment in the classroom scene is precisely violent behaviour. Related to the motif of ancientness/modernity, is another motif, of timelessness. There are quite a few clock faces in the early stages of the film: on the church tower, in the restaurant, in the classroom and on Cole’s wristwatch. Even with all these reminders of time, Malcolm is still confused about it. He misses his first appointment with Cole, and when he arrives too late at the restaurant, he complains to Anna that, “I just can’t seem to keep track of time.“ It is only fitting, then, that after three correct guesses during the mind-reading game, his first stumble has to do with Cole’s wristwatch. It is even more fitting that the watch does not work any more. 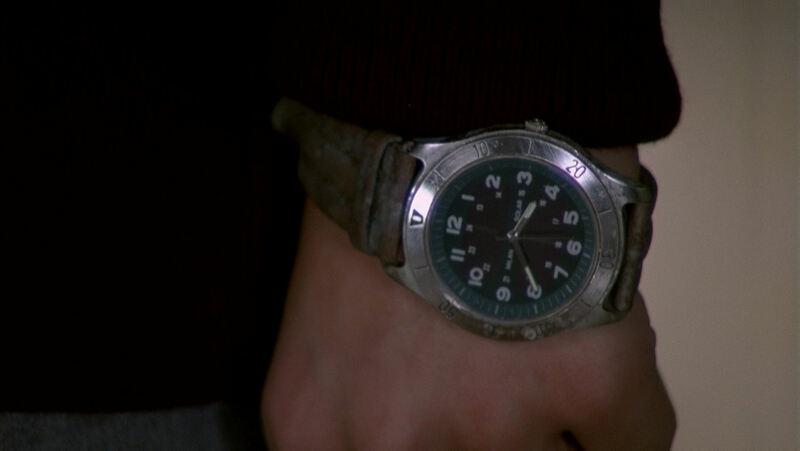 Cole’s wristwatch is frozen in time, like the ghosts and the statues in the film. When Anna shows the Burmese Sapphire ring to the Indian couple, she emphasises its timelessness. 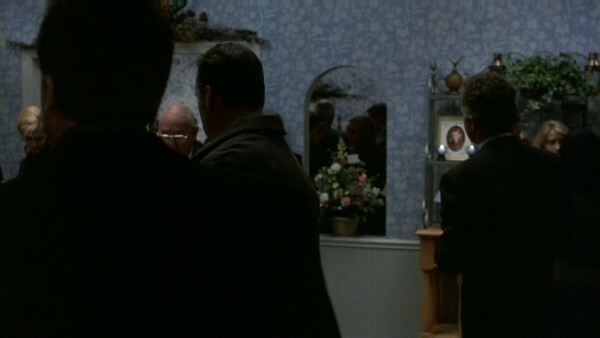 This scene also starts with a statue of a soldier of ancient Greece (probably) and an adoring woman, before the camera tracks laterally to the left, to Anna and the couple. The movement seems to tie the two couples together, in the process underlining the timelessness of human love. In its closing minutes, the film starts to cut swiftly between flashbacks and the current time plane with Malcolm and the sleeping Anna in their house. This is not unusual in films, of course. 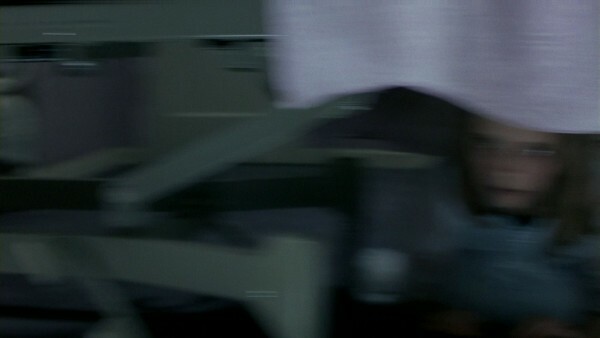 At one point, however, Shyamalan leads us to believe that we see Malcolm in the present plane, pressed against a wall, but then it is revealed that he is actually lying on the bed in the flashback plane. This seems to be about more than just an elegant and striking transition. Rather, it appears that time is somehow breaking down, and that time may be meaningless to ghosts – trapped as they are in a limbo, doomed to repeat their actions. As speculated upon in the discussion of the opening scene in the second article, it is a fascinating idea that ghosts can travel through time, so that Anna somehow can feel the presence of Malcolm’s future ghost in the cellar. This timelessness of a ghost’s existence could explain the curious problem about the appointment report Malcolm is seen with in the cellar, after the first meeting in the church. 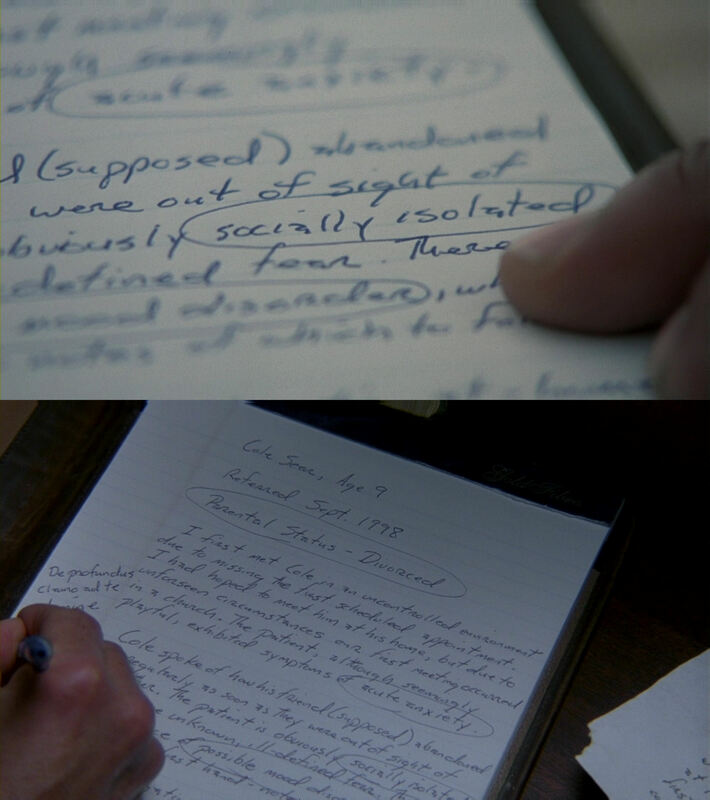 For the content of the sheet of paper seems to be identical to the sheet we see when he is waiting for Cole on the bench, before the meeting. 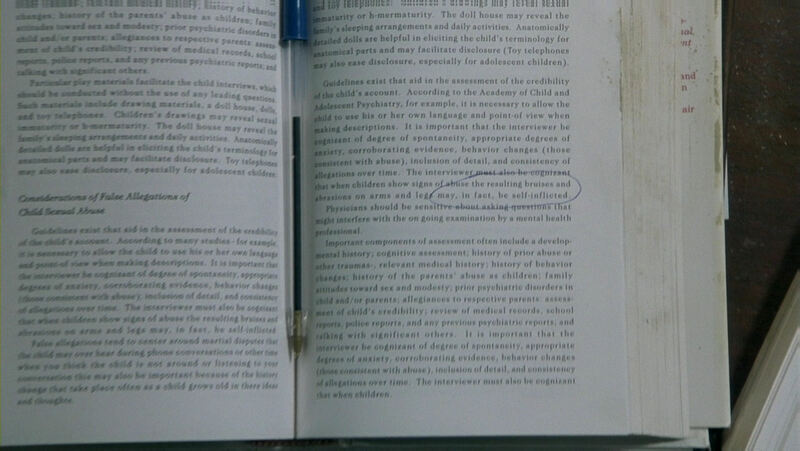 There is also a passage about Cole’s treacherous friend Tommy Tammisimo, about whom we hear nothing during the first meeting, but he is discussed at a later appointment. The identicalness of the papers is probably just a continuity error, and a minor one at that, but it is comforting to at least have some way of explaining it away. The papers before and after the meeting are clearly identical. It might sound strange to compare M. Night Shyamalan to Yasujiro Ozu, the Japanese master of serenity and calm, but The Sixth Sense displays some similarities. The second article discussed the opening scene and how a stationary camera “moves” methodically, through editing, along the walls of a box. This is reminiscent of the way Ozu would organise dialogue scenes, with the characters always facing the camera (like Anna does for most of our scene), each cut with a camera placement swiveling most often 90 or 180 degrees with the change of shot – except that Shyamalan is placing the camera along the walls of the box rather than at its centre. The use of the colour red in so many shots could be compared with Ozu’s obsession with the same colour, for example in Equinox Flowers (1958). But the greatest similarity has to do with the shots of statues in The Sixth Sense, which serve a function not unlike Ozu’s famous pillow shots. (The seminal work “Ozu and the Poetics of Cinema”, where David Bordwell is discussing many of the stylistic devices mentioned above, is available on-line here.) 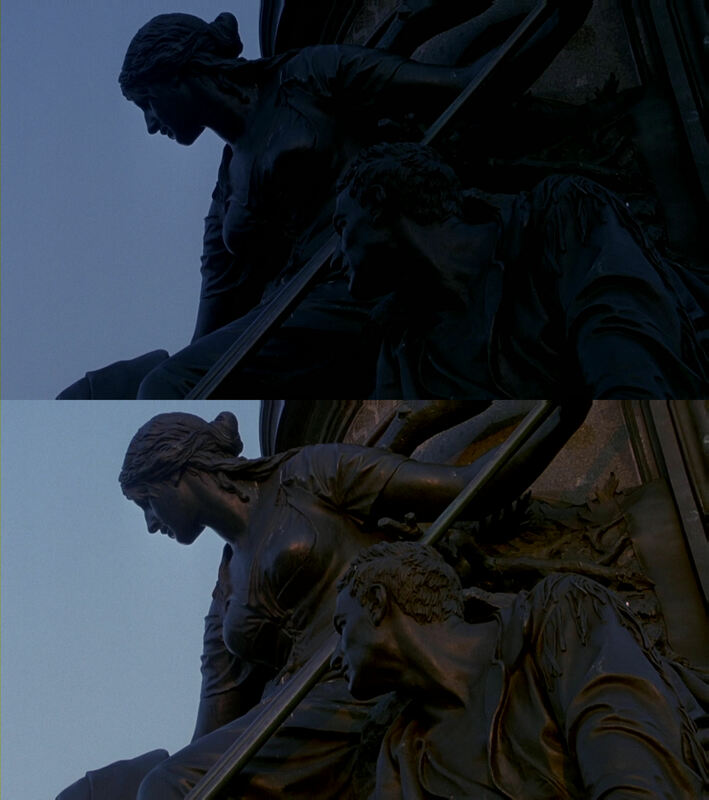 The statue shots seem laden with a special weight and meaning that far transcend their function as a marker that time has passed since the previous scene. They seem also to be solely connected with morning scenes (although the exact time of the last of the three occasions, the antique shop scene, is a bit hard to determine) and with a movement from darkness to light. But like the slowly awakening light bulb of the film’s opening shot, marking a similar movement, there is an ambiguity at play here, that the journey towards light is tarnished by something ominous. This is the Swann Memorial Fountain which consists of three Native American figures, two females and a male, symbolising the area’s three major rivers. Contrary to the other “pillow shot” situations, it consists of two shots, possibly to show figures of both sexes, the male being obscured by the centre fountain in the long shot. By fading the first shot up from black, a stylised illusion of the monument appearing out of the morning dark is created. 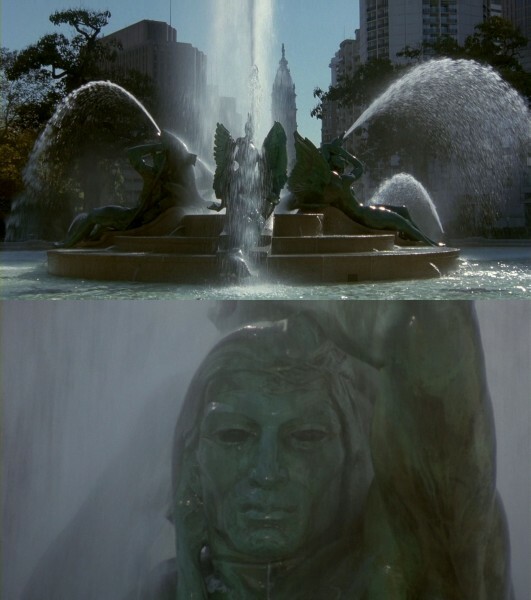 Swimming in this fountain is a Philadelphia tradition, alluding to a dialogue line during Lynn’s happy day-dreaming game early in the film. This is possibly why it is chosen to introduce the carefree scene where Lynn and Cole are racing with the shopping cart. 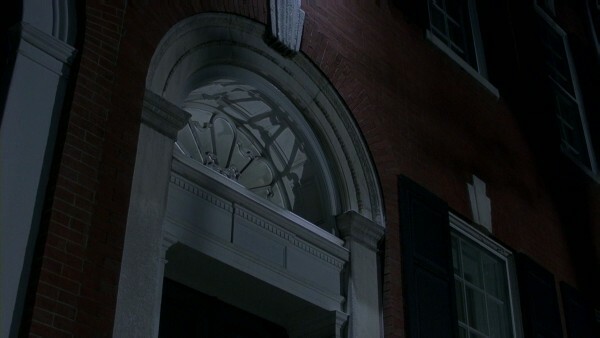 It appears after the scene with the three hanged ghosts. 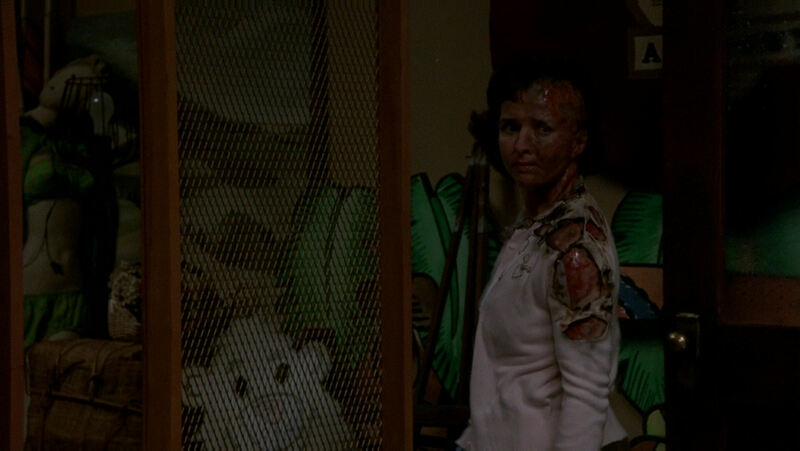 …and before the antique shop scene. That scene starts with a highly pregnant shot of a statue of an affectionate couple from antiquity, him probably being a Greek soldier. For many reasons, it is tempting to draw a connection between the ghosts and the statues. A common depiction of ghosts is that they show repetitive behaviour (only appearing at a certain time, in a certain room, wearing the same clothes, etc. 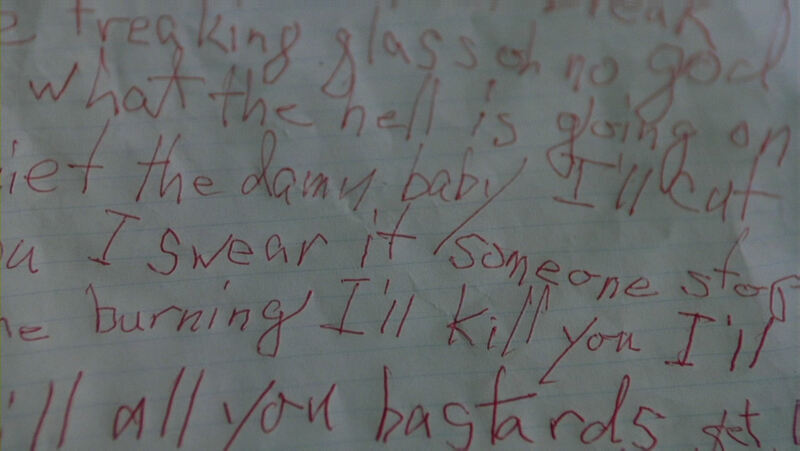 ), like the kitchen ghost (at least) and the boy with the head wound at Cole’s apartment seem to do. Like ghosts, statues are frozen in time, doomed to the same repetitive “behaviour” day after day. (They “operate” during the daytime, which may be another reason for their connection to mornings.) The historicity of the statues (George Washington and settlers of “The New World”, Native Americans from the old days, a Greek couple from antiquity) makes them “ghosts from the past”, with an especially grave undercurrent since the American statues depict oppressors and oppressed from the country’s past. Here the ghost/statue connection even seems to be further underlined by the dissolve, making them appear to melt into each other. There is a male and a female statue inside the church as well. (The St. Augustine Catholic Church.) Their left/right placement also forms a direct parallel to the Native Americans “holding up” the City Hall. This constellation is especially interesting in light of the female/male motif. There are two scenes in this church. 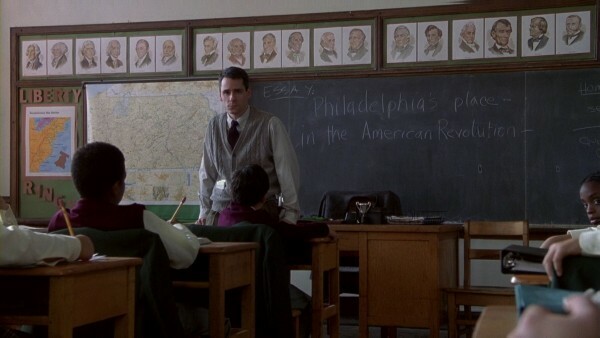 In the first one, Malcolm and Cole sit on the left side of the aisle. This is at a stage where Cole is yearning strongly for his father and where he is playing with male toy soldiers inside the church. There is also a hardness to the scene, and a refusal to communicate properly with Malcolm. At the start of the second scene, he is still playing with the soldiers and at the end of that part of the scene, as we saw when discussing ancientness/modernity, the camera lingered on a glass painting with a male figure. 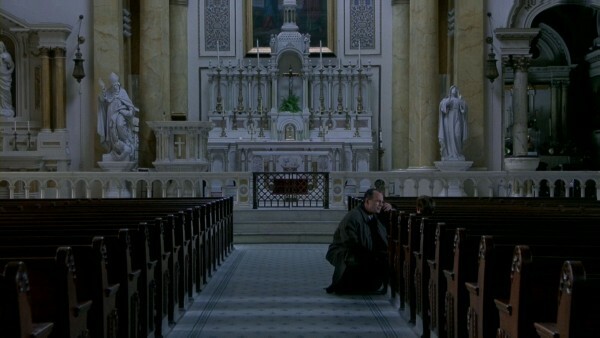 After Malcolm and Cole have joined each other on the church floor, however, they now sit on the right side of the aisle, below the female statue. At this point, Cole’s yearning for his father has abated since Malcolm has become a father figure. Instead, Cole has become concerned about his mother, who is very unhappy. Furthermore, the fact that Malcolm is suggesting something dangerous – to listen to the ghosts, “even the scary ones” – could make Cole want to seek comfort from a mother figure. Another connection to the female statue: in the next two scenes directly after this, females play an important part. First, Cole will soothe Lynn back from her nightmare into a peaceful sleep, and then Kyra’s ghost will turn up. In both scenes, Cole needs to use his capacity for caring and empathy, to see the tragedy behind the vomiting ghost’s disgusting behaviour. 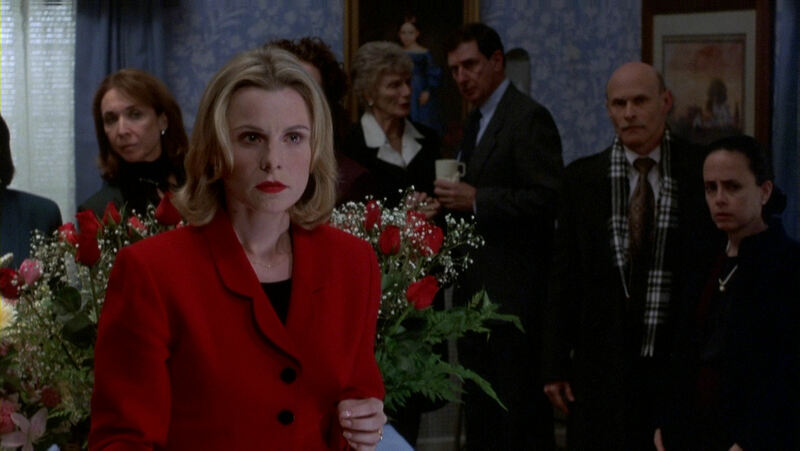 Caring and nurturing are traditionally regarded as “female values”, which is part of the symbolical reason why Cole has turned away from the stern, admonishing statue of the bishop. 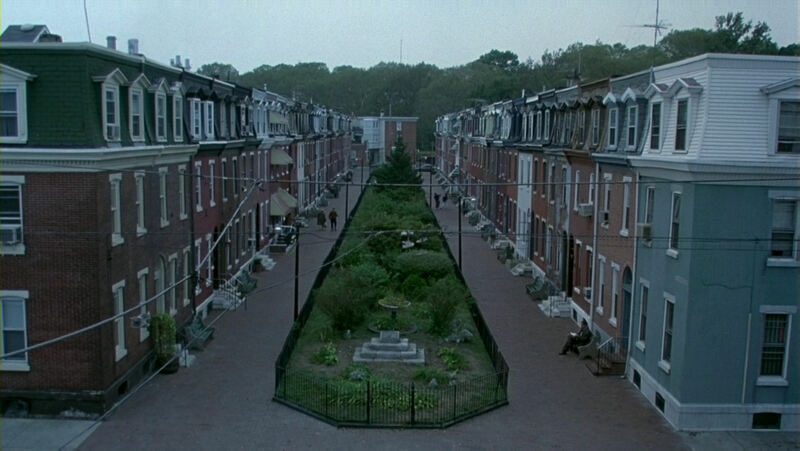 While we are at the subject of real-life Philadelphia landmarks, readers might be interested in this fascinating tour of the film’s shooting locations. 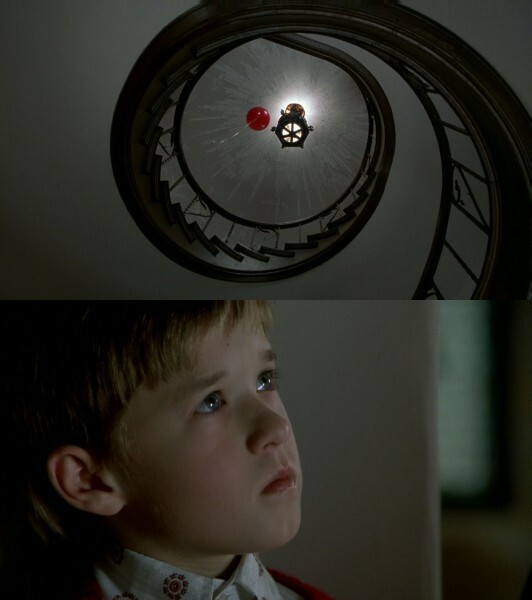 One of the most curious motifs of The Sixth Sense is the fact that elements are repeated three times (or built around the number three), on a rather massive scale and in a wide variety of ways. This has possibly to do with the well-known “rule of three” in writing, for example all-pervasive in fairy-tales. In this film it is probably mostly intended as a way to create a feeling of coherence that is not consciously noticeable by the audience – the task of so many motifs. It is most definitely a pattern of interest, since this feature of the film clearly is over-represented (for comparison, it is not present in Unbreakable). I am perfectly aware of the “if you look for something, you will find” syndrome, but the pattern is firmly established by being connected to major events or elements of the film. This serves as an enabler to assign importance to the pattern and justifies looking for it on a smaller scale as well. 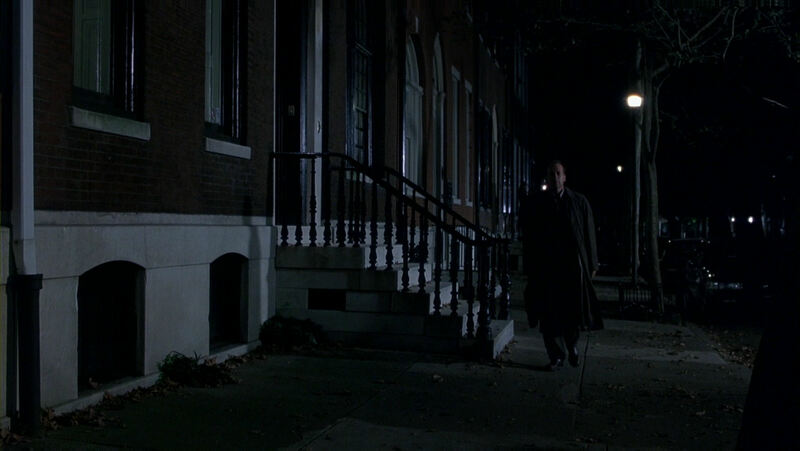 In one of the most pronounced manifestations of the motif, Malcolm arrives home three times, in visually similar fashion. The two rows of houses and the greenery area in the middle form three sets of objects. 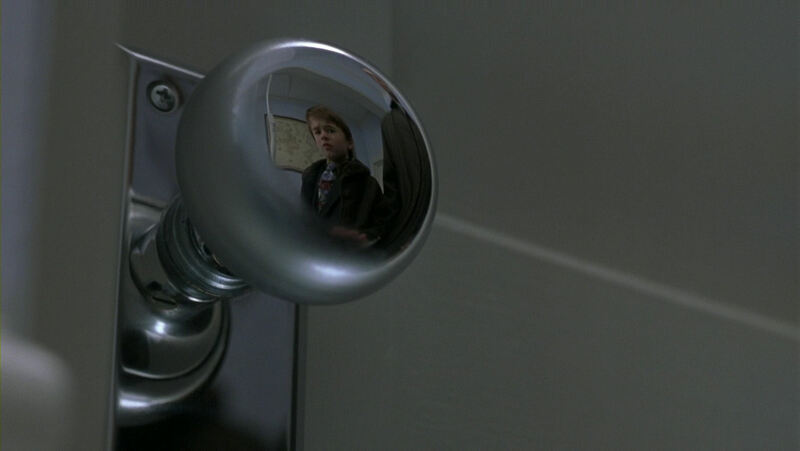 We shall now briefly browse through some of the visual motifs of The Sixth Sense. Most of them have already been investigated quite thoroughly as a consequence of the material discussed in the two first articles (and arches were touched upon here). For these I will only mention a few of the more subtle examples. 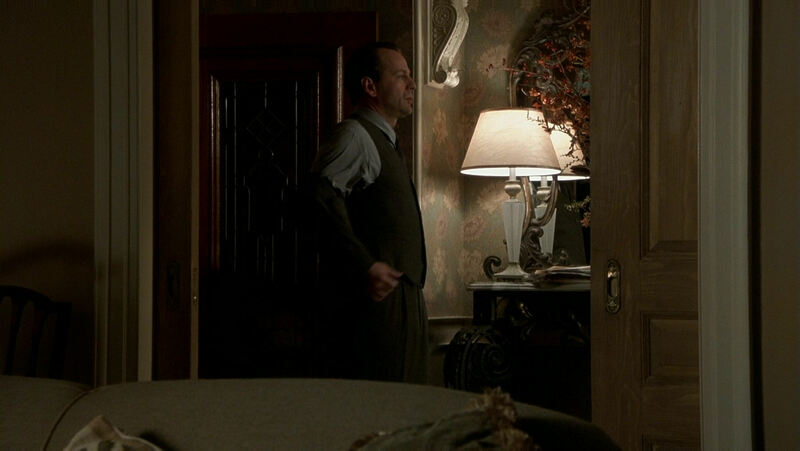 …leaving for the stage, Stanley tells Cole about a fire long ago, but Cole already knows it from the ghost. The door in the background serves as a quiet reminder of the ghost. 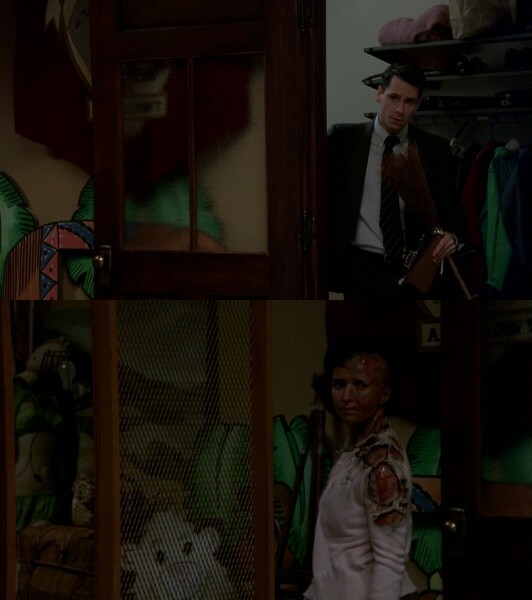 By the way, look how the door shots are nicely connected, through composition and the use of green. In directly opposing walls, two doors, one for the dead and one for the living – hidden in realistic surroundings, a poignantly poetic expression of the film’s theme. 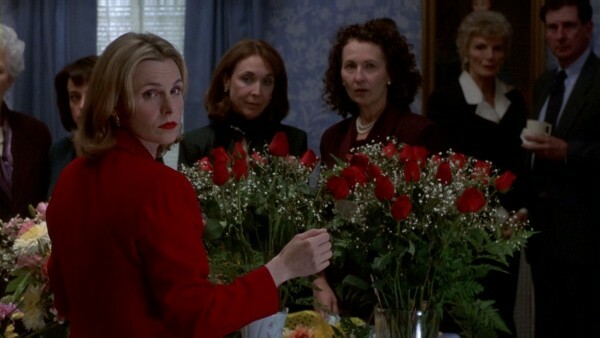 Flowers, however, have not been discussed so much. The Sixth Sense is awash with flowers, on wallpapers, pillows, lamp shades, dresses and so on. One should be careful not to make too much of this, since this is quite normal in real life. Nevertheless, there is particularly one pattern that seems meaningful. Anna has a suitor, Sean, who is her employee at the antique shop. 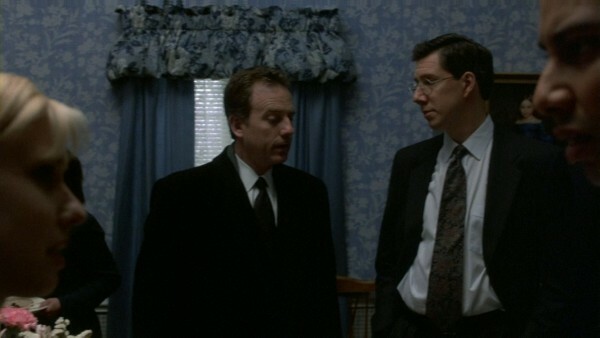 In a parallel to Vincent Grey, Malcolm comes to look at Sean as an intruder in his life. 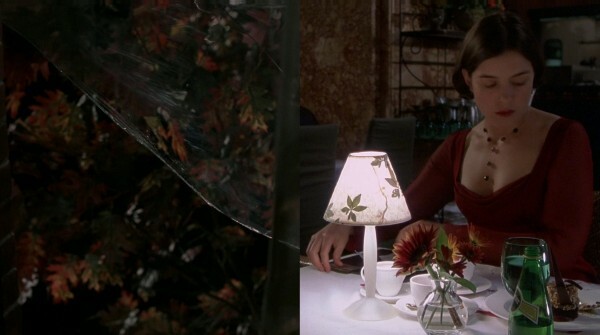 There is a motif of red and yellow flowers/leaves in the film, first seen on the autumnal leaves through the window Vincent Grey broke to enter and kill Malcolm. The motif represents something that drives Malcolm and Anna apart. We see it next in the restaurant scene where they are unable to communicate. 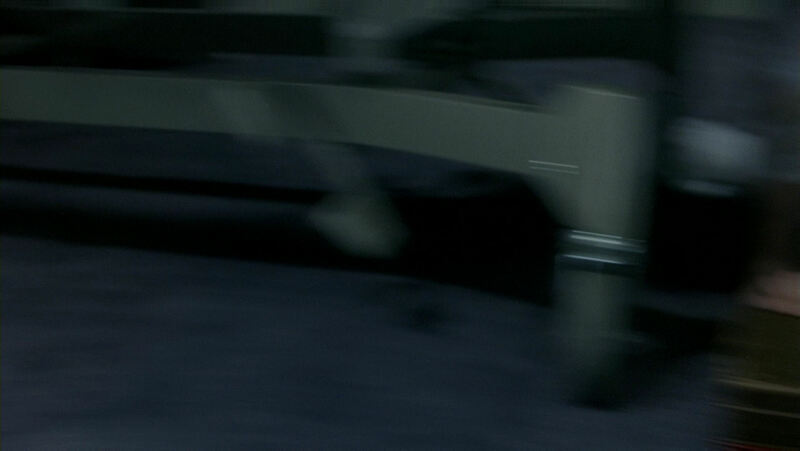 …when they run to investigate, the camera has almost returned to its original starting point. Status quo is re-established, for Malcolm has succeeded in driving them apart, at least temporarily. 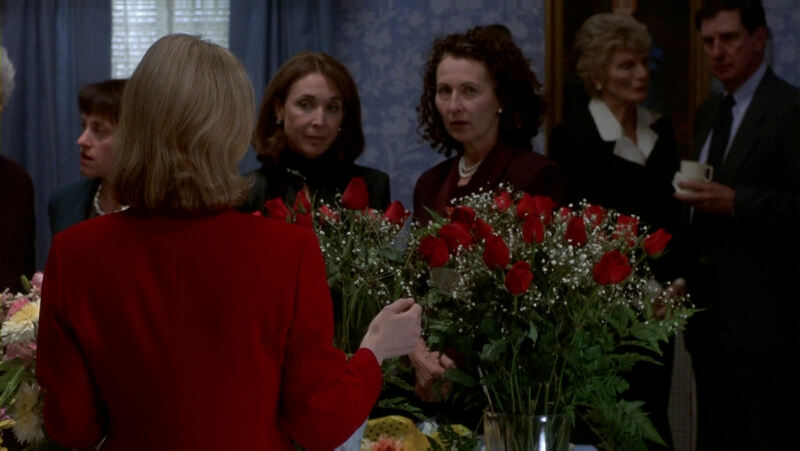 It also seems meaningful that the vase is left to somehow dominate the shot. 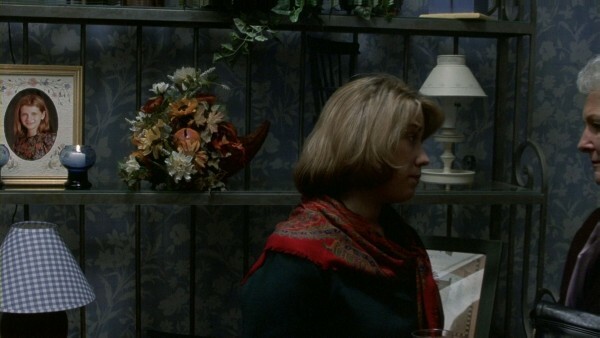 We see Anna framed in the broken window, connecting back to the start of the red and yellow motif, and the window symbolising the cause of her bereavement. But by breaking the window Malcolm has repeated Vincent’s action when Vincent broke into the house – Malcolm has become a destructive force in her life almost as bad as Vincent. 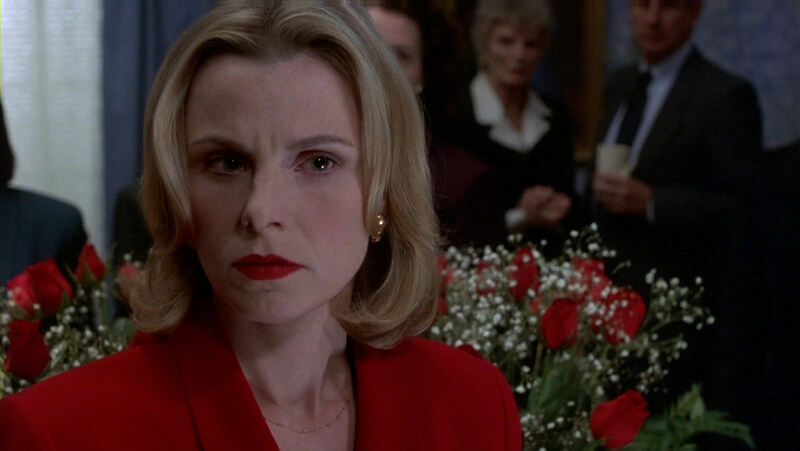 Who the hell is wearing a red dress for her small daughter’s funeral?? Unbelievable on a massive scale – but this is what you can get away with when the audience is already eating out of your hand. Almost the only thing not red about the “bad mother” is her fingernails. This seems to be an intentional contrast to the “good mother”, who – except for the red sweater at the very end – virtually never wears red, except on her fingernails. Since red is used to mark when ghosts are interacting with the living, Lynn’s fingernails become an invaluable signalling tool. She just can’t help sticking out those fingers. But it always seems natural. Here she touches her brow in resignation over Cole’s strange behaviour, but it also signals that the impression of a ghostly, moist hand will appear on the kitchen table. The hand movement in itself creates a nice connection to the other hand. Malcolm is often seen with small lights in the background. 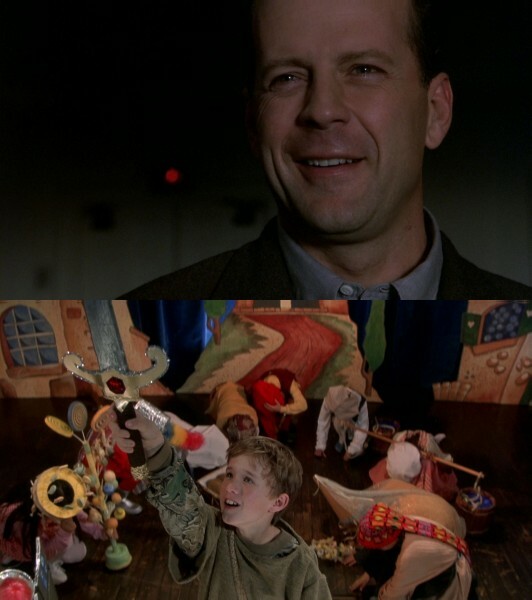 Here he is watching Cole’s starring role in the play, and the jewel in Cole’s sword handle is also red. Often the usage of red can seem overly overt, but if you enlarge this image, you will see that the faraway traffic light is also red. … and a traffic light, almost imperceptible (above the roof of the car), is also red. 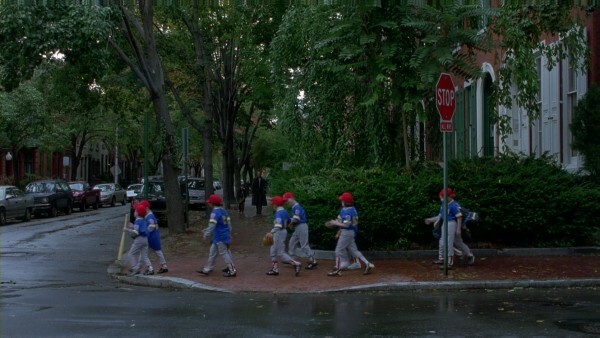 Shyamalan has definitely made sure that the traffic lights are on his side in this film. The idea is implemented with relentless vigilance, taken to brilliant heights here – the ghost will only be audible on the loudest volume. 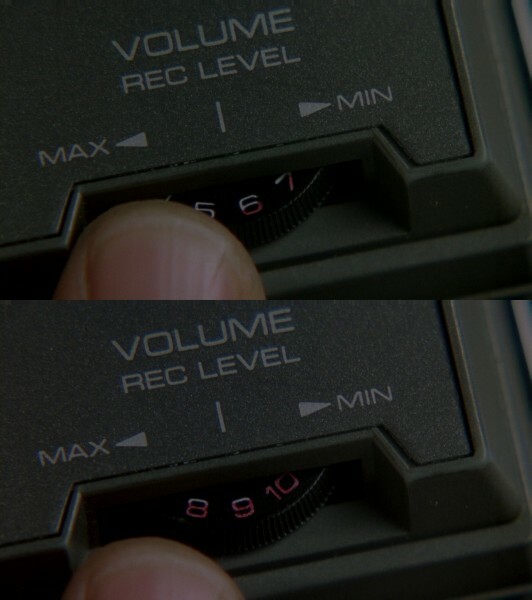 Shyamalan even contrives to use the “red signal” on a tape with sound only. 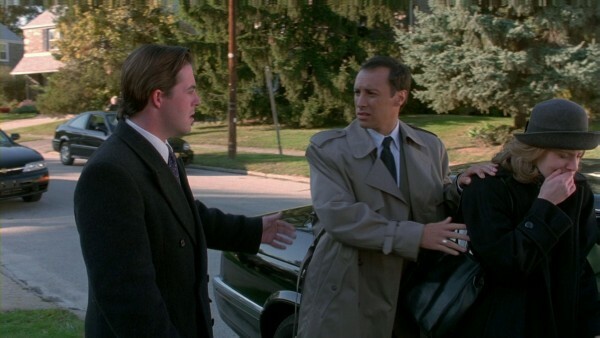 At one point in the recording, Malcolm tells Vincent, “When I was a kid, I had this blood test done, and I threw up chili cheese fries all over this male nurse.” Blood is red, which signals that the ghost soon will come to haunt Vincent while Malcolm is out of the room for a while. 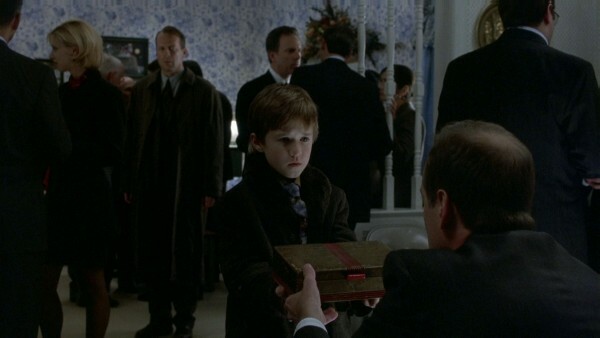 Before we start our look at the fascinating post-funeral sequence, let us finish off the motifs by having a look at some that are part of a recurring body of motifs in the five M. Night Shyamalan films we are considering in this article series. Basements, where important events take place in all five films (although less important in The Village). 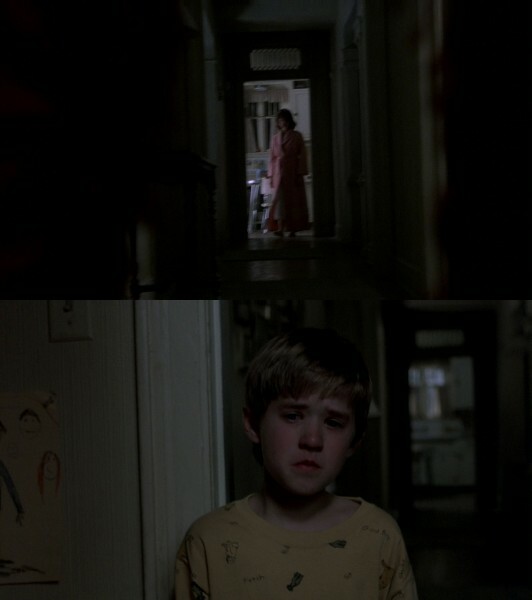 In The Sixth Sense the important stuff is the opening scene, the fact that Malcolm “lives” in the cellar, and that he finally grasps the solution to the mystery there. Car crashes happen in several films, in The Sixth Sense it creates the traffic jam and the last ghost of the film. Mentor characters: both Cole and Malcolm will act as mentor characters for each other. 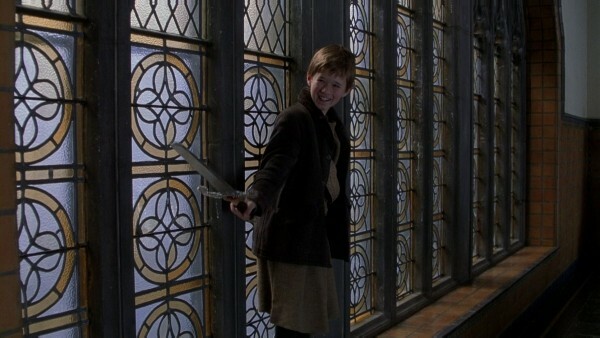 Cole teaches Malcolm about the ghost world, and Malcolm teaches Cole about how to deal with the ghosts. Rituals are often used as a tool to reveal or find out about secrets. In The Sixth Sense we have the mind-reading game, the free association writing, Malcolm performing the magic trick, Malcolm telling a secret coded as a bedtime story. 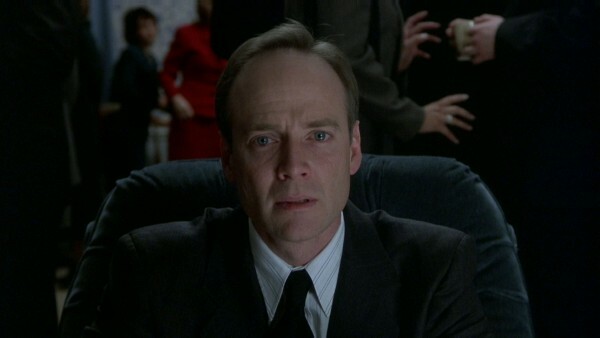 When Cole tells Malcolm about his ability to see dead people, the dialogue takes on a strange ritualistic air, and Malcolm seems virtually hypnotised by the whole situation. 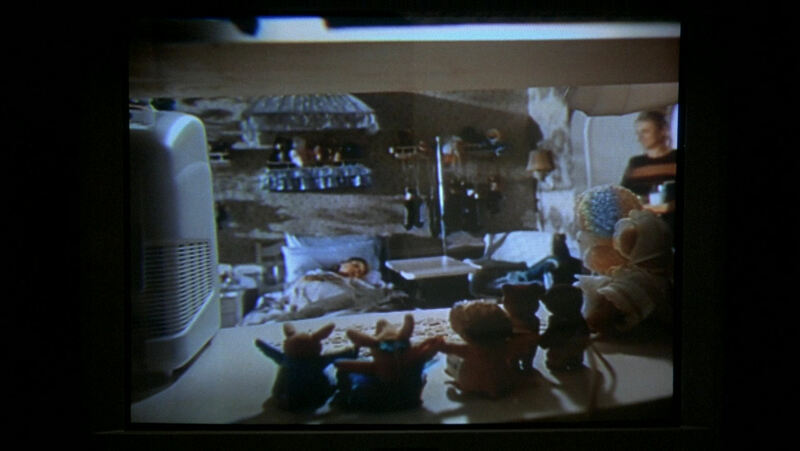 The characters are constantly performing other rituals: Cole and his mother’s day-dreaming game, the ritualistic nature of the stage plays, Kyra’s puppet theatre (interestingly, the secret of her poisoning is captured on tape immediately after the theatre ritual has finished). Malcolm’s behaviour is depicted as a ritual: three times he is seen coming home in the same way, and every time he wants to open the cellar door, he struggles with the knob in the same way, only to start searching for the key in his pocket. During the audiotape scene in the basement, the repetitive starting, stopping and rewinding of the tape have a ritualistic air. 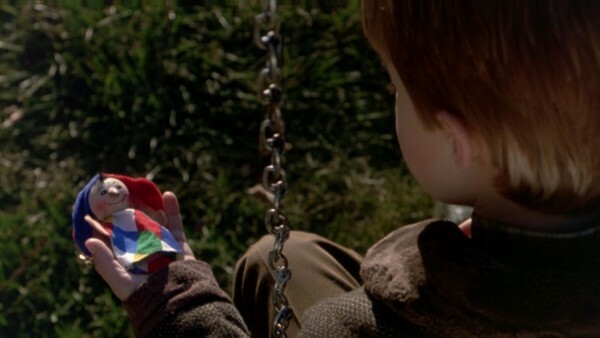 In fact, there is a sense that watching an M. Night Shyamalan film is a ritual in itself. A big role is played in that by what this article is about, namely the repetitions of, and variations on, a large number of recurring motifs, often resonating across several films. Pretending and self-reflexivity also play a considerable part. 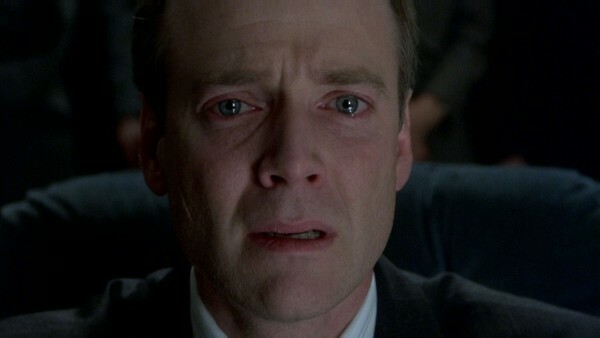 When Cole and Malcolm bid a final farewell, they pretend that they will see each other the next morning. 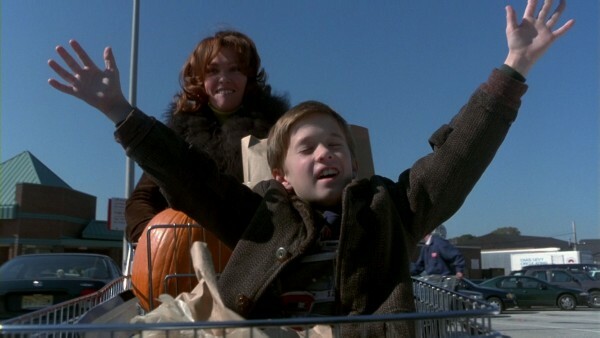 In one scene Cole and Lynn pretend that their shopping cart is a racing vehicle. Kyra hops into bed, pretending to be asleep when her mother enters, probably because she is not allowed to be up. 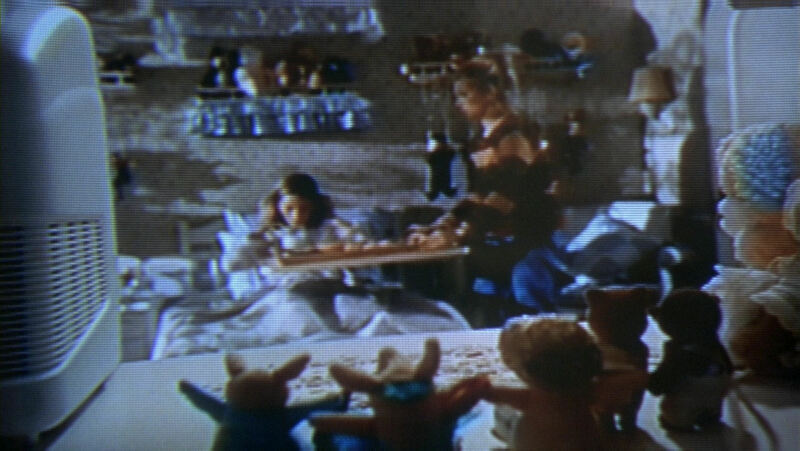 Malcolm also recapitulates the story of the film so far in the guise of his bedtime story. Kyra’s videotape can be seen as a film within the film, and as we shall see, it reflects Shyamalan’s own filmmaking method. 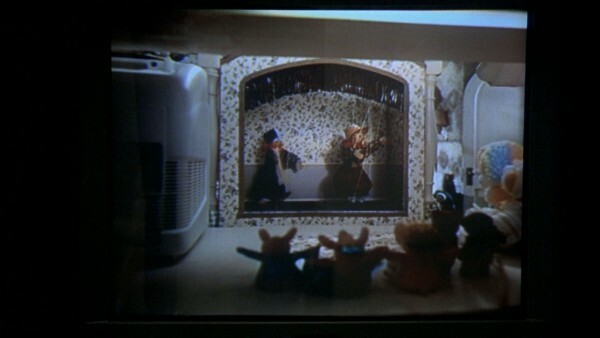 There are three “plays within the film” – two stage plays and Kyra’s puppet theatre – and the stage plays, at least, comment upon the film’s action. 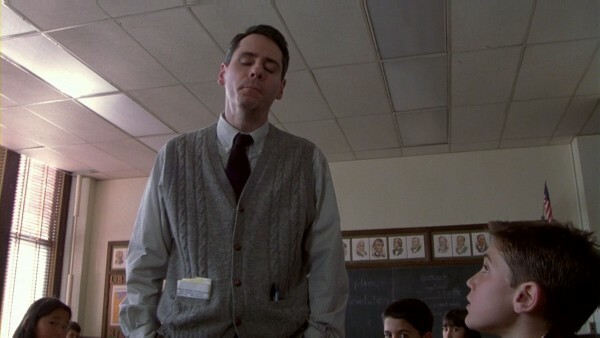 The first one starts with the line, “Once there was a boy, very different from all the other boys. He lived in the jungle, and he could speak to the animals,” which is obviously about Cole. (Both plays are videotaped by a whole bunch of parents, as if an echo of the wedding video and Kyra’s videotape). When the nasty boys are cornering Cole on the staircase, they claim they are going to “put on a pretend play”. One of these nasties is Tommy Tammisimo, who is forever stuck-up because he once acted in a cough syrup commercial. 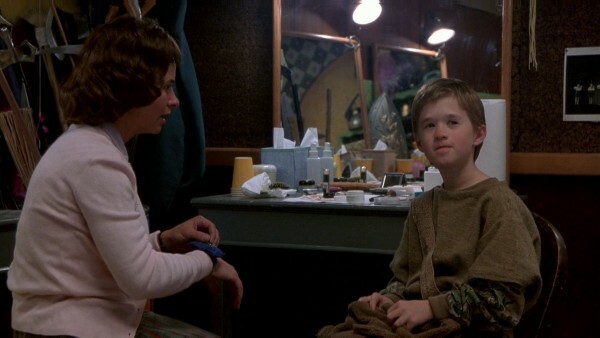 Both his name and his arrogance seem to express a film director’s nightmare vision of a child actor, in stark contrast to Haley Joel Osment‘s performance in the film itself. Shyamalan’s nightmare vision of a child actor. From watching this sequence the first time, I remember well the feeling of being engulfed by a slowly building, irresistible wave of shock and sadness. I cannot explain its full impact through the following images, but I will do my best to point out some important aspects. This eight-minute sequence has the feel of being a short film within the film, something that is accentuated by it both starting and ending with a black screen for a pronounced duration. 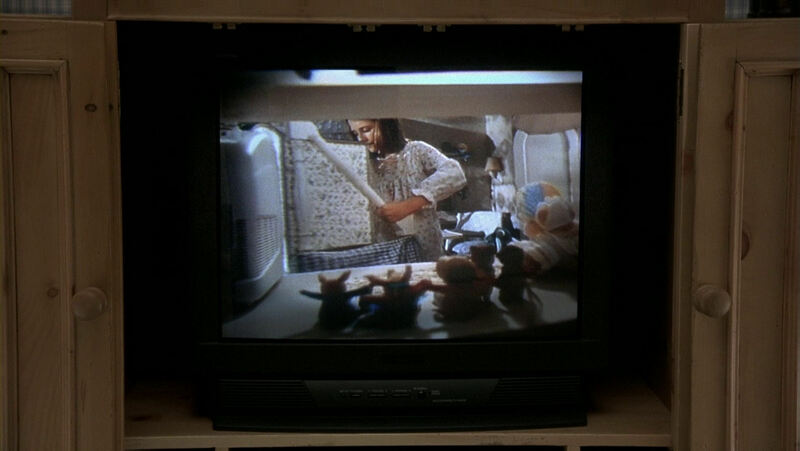 This book-ending technique is also applied to the screening of Kyra’s video, which both starts and ends with the static snow of the empty TV screen, and, as we shall see, to the centre-piece shot of the sequence. 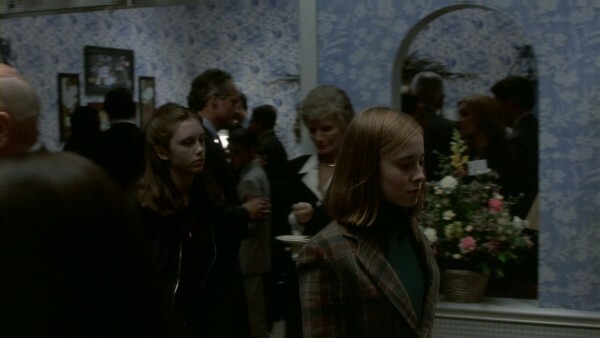 This feeling of balance is further maintained by the over-arching scene structure, which is unfolding and then refolding: after a prologue, the characters reach a house, where there is a scene outside the house, then in the living-room, in Kyra’s bedroom, in the living-room again, before everything ends with another scene outside. Shots as well are set up in ways that echo each other. On the whole, the sequence is governed by a specific mise-en-scène that seems designed to make it function and stand out as a self-contained unit. Most important of all, perhaps, is its extraordinarily slow pace, which we have already discussed in the first article, in the chapter “Staging slowness”. The proceedings are drenched in slowness, partly to create a heightened sense of awareness that makes various elements take on an iconic status. 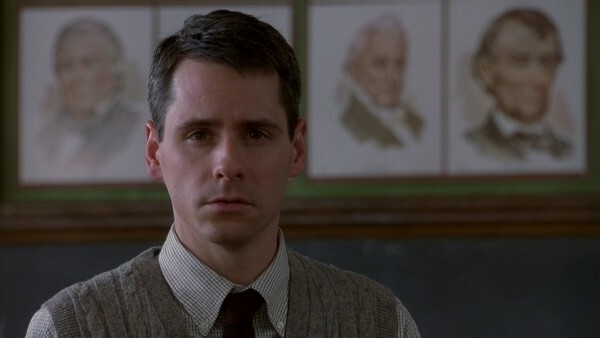 James Newton Howard‘s music of elegaic lament is also invaluable, of course. 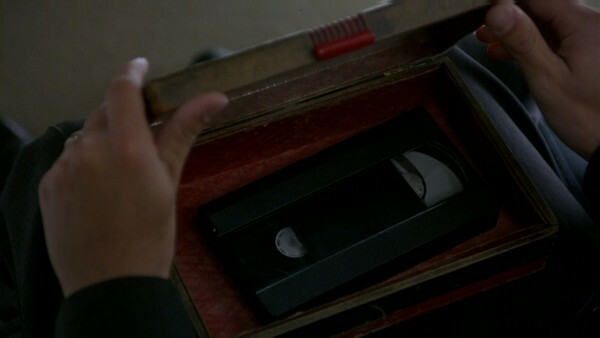 It is subtly changing in mood for almost every scene, reaching its absolute high point in the extremely bleak, requiem-like composition during the viewing of Kyra’s videotape. 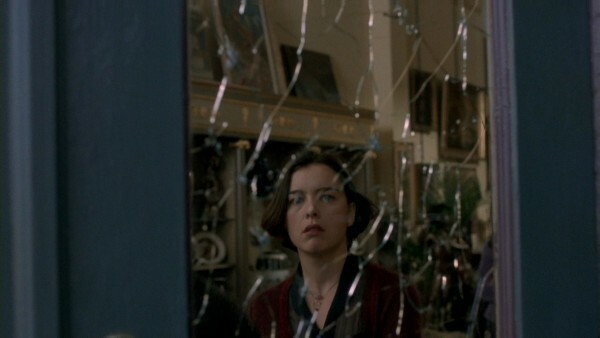 In typical horror film fashion, the hyper-tension of the previous scene with Kyra’s ghost is relieved by something relaxed and mundane, in this case a bus trip. We have no idea where they are going, however, and the setting, which is completely unconnected to anything we have seen before, helps signal the uniqueness of the sequence. The destination turns out to be a post-funeral gathering. 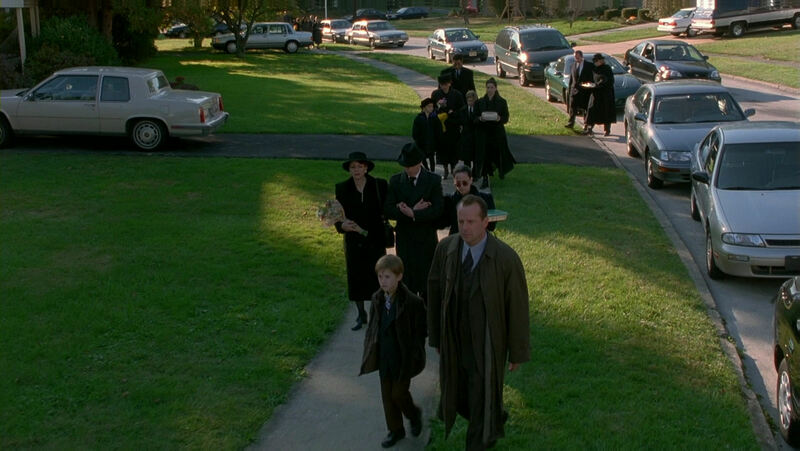 The sequence is marked by long, wandering takes, where an important device is that Malcolm and Cole will weave in and out of the shots, and in and out among the other mourners. …before the camera returns to the protagonists. This is Kyra’s little sister, and the colour of the swing set foreshadows the colour of all the rooms in the house and on Kyra’s gown. 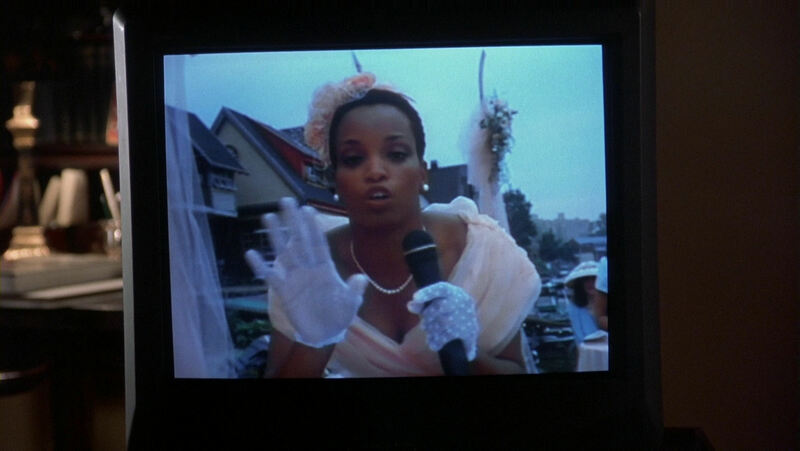 …like with the previous one, the camera stays to fixate on it, ending this long take on an iconic note. …the foregrounded puppets also serve as misdirection, to make the shock of the sudden hand that comes out from under the bed all the greater. …so that the centre-piece and most dramatic shot of the sequence becomes book-ended by Cole’s face, echoing all the other book-ending discussed in the introduction to this chapter. The camera movement of the whole scene is also closely related to the scene where Kyra’s ghost turned up in Cole’s tent. … the pronounced staging in depth, and the way separate narrative units now have been combined into one continuous take. (On a meta-continuity level across time planes, it is amusing to note that the mother left in the background just before, and now she turns up in the video, as if that was the real reason she had to leave…) IMDb lists as a “goof” the fact that she enters the room on the right side of the bed, when Cole was seen standing on the left side of the bed after entering. 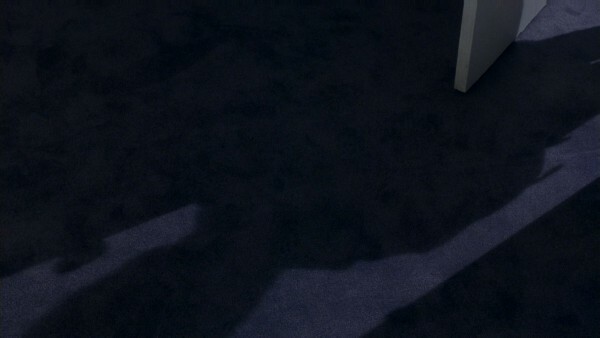 But Cole may perfectly well have entered through that door, his position by the bed simply being the end point of his journey during the shots when we saw him as a shadow. …the bad resolution of this last, closer shot of the TV screen makes her look like a ghost already. …ending with an utterly empty look, as if she cannot even comprehend her own evil. In this film, the human beings, not the ghosts, are the real monsters. The sequence ends outside, with the red tail-light of the car signalling Malcolm as a ghost. 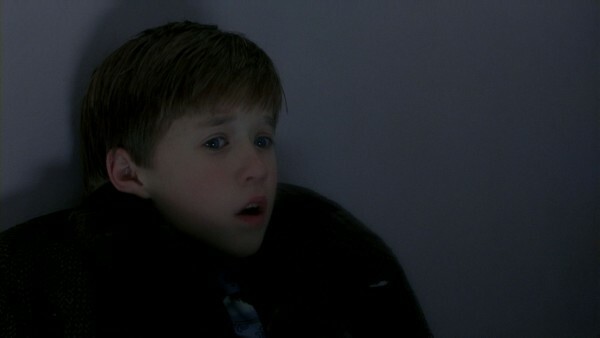 The little sister: “Is Kyra coming back?” Cole: “Not anymore”. It seems like the sister, too, has been able to sense the ghost, and now that her murder is solved, Kyra has no more unfinished business. So even though Kyra is freed, this too is shaded with a certain sadness, because the sister will not have her around anymore, even as a ghost. Like so often in Shyamalan’s work, there is no payback, no revenge, no sense of triumph that the criminal has been caught, just an immense sadness about the violent nature of humankind. The long shadows perfectly capture the mood. At the same they summarise dominant features of each of the three previous shots (the swing set and the children). But it is not only Kyra’s ghostly presence that will end along with the lowering sun. 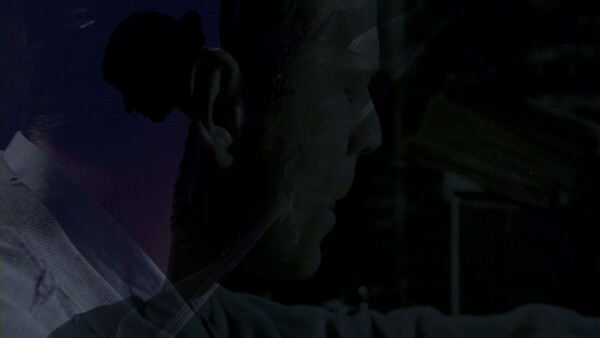 Malcolm turns away, as if he has a premonition that he, too, will cease to exist, now that Cole is on the way to becoming healed. The constellation of Malcolm and the shadows, through both their difference of appearance and their opposite directions in the shot, indicates his apartness. 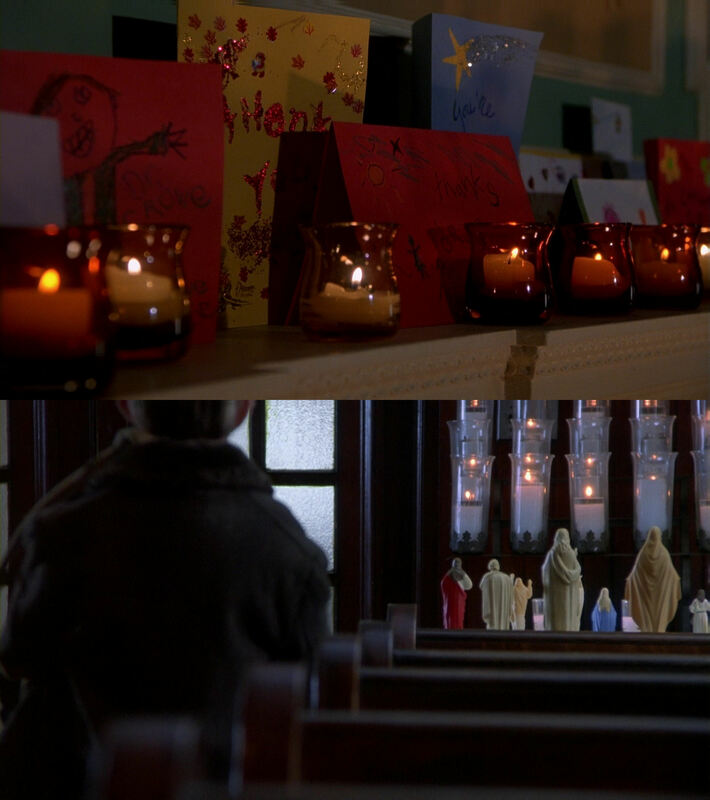 M. Night Shyamalan has in The Sixth Sense created a whole society of motifs, patterns and connections. Like the ghosts of the film, they exist side by side with the surface storytelling, interacting with each other, creating yet more connections. It is not that M. Night Shyamalan does anything revolutionary or that his devices are not in the playbook of most able directors. The difference is the sheer amount of it, the meticulousness and love with which it is carried through. 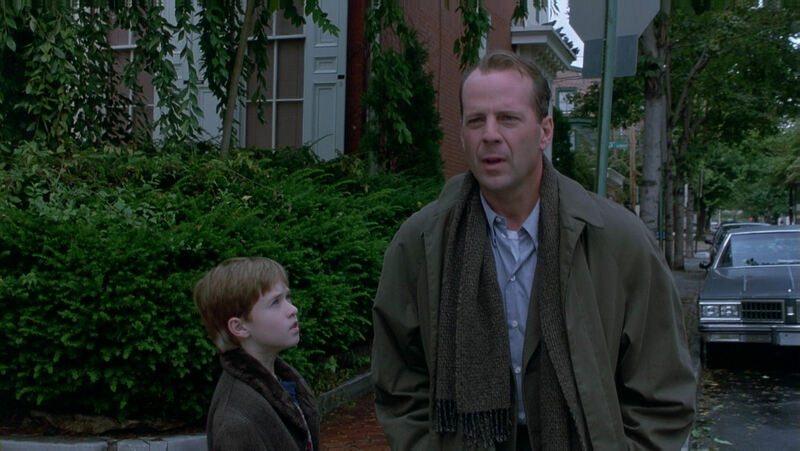 Together with a gripping story and unforgettable characters, his attention to structure and coherence is instrumental in making The Sixth Sense a masterpiece.